We hit a HUGE milestone today, hitting day #365! But we aren’t finished yet. 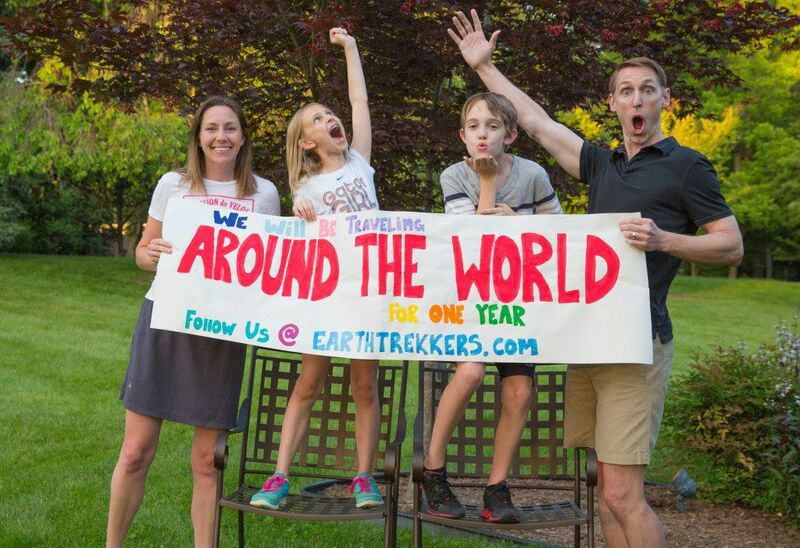 Surprise, surprise…our “one year” trip around the world grew to 13 months of travel. We have been having so much fun we are just not ready to go home, not yet. 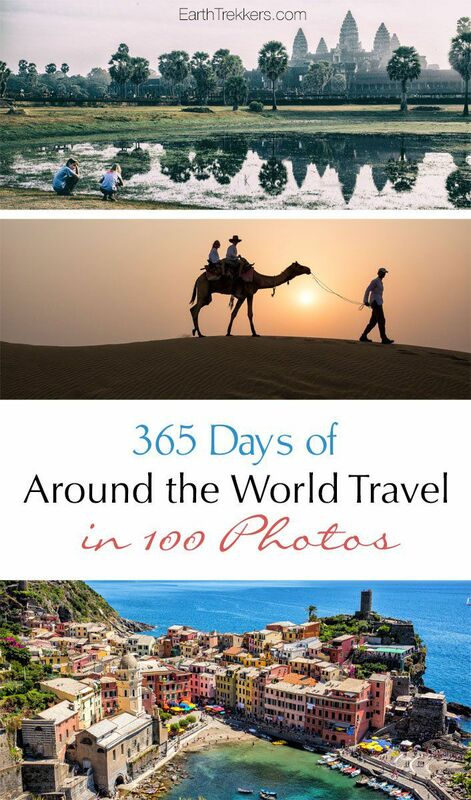 So, here we are, 32 countries visited, 365 days of travel, and thousands of memories made. Here is a recap of our year, shown with our 100 favorite photos. In no particular order at all, here are some of our best moments, favorite spots, and unforgettable things we have done. Most captions link back to the post for anyone interested. Enjoy! Our year around the world began in Rome, Italy. Here are Tyler and Kara, on day three of the trip, happy to be in Italy, eating pasta, and wondering just what this year holds in store for us. We love taking these goofy family photos. We shoot a few serious ones but the crazy ones are our favorites. 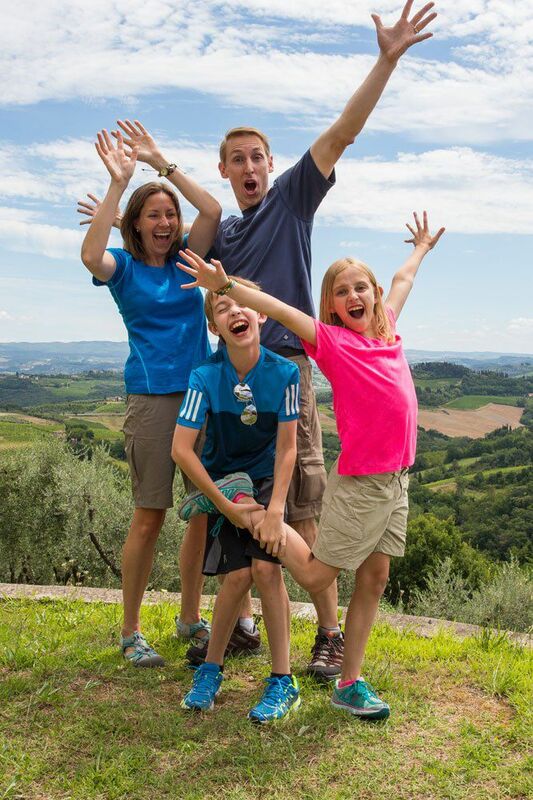 Here we are in Tuscany, at the very beginning of our adventure, fresh, clean, a little naive, and ready for anything. 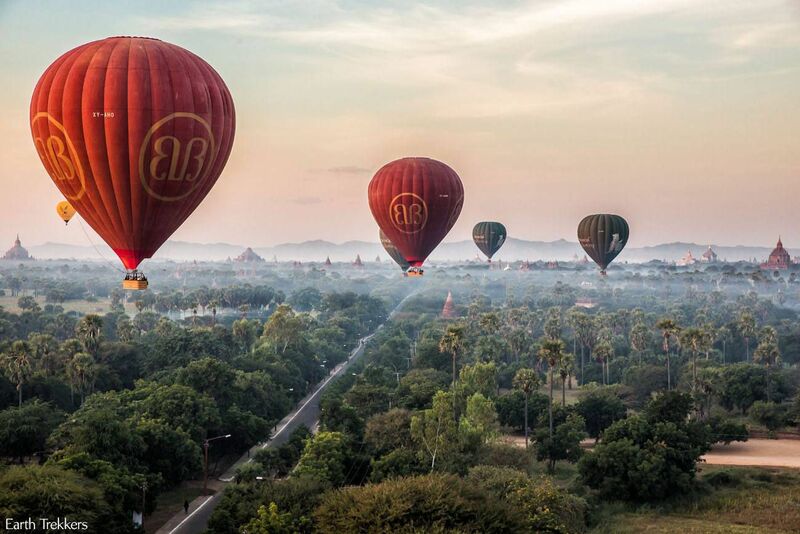 A hot air balloon ride over Bagan, Myanmar. 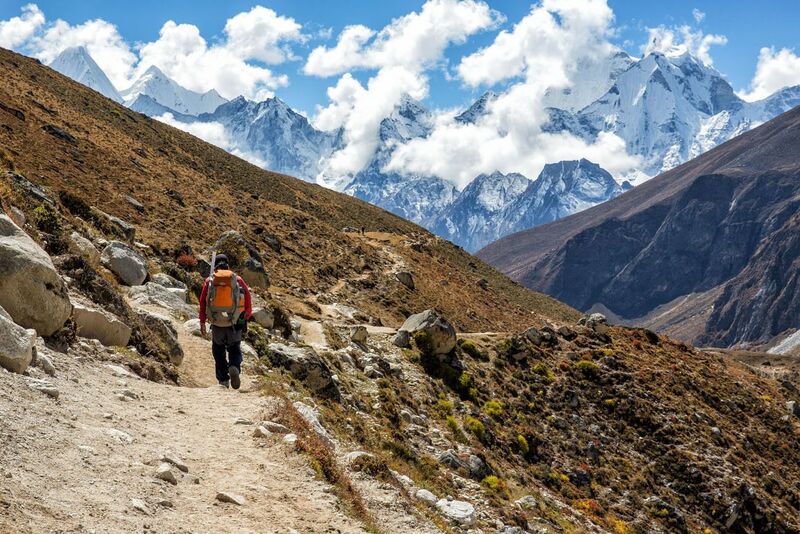 Trekking back from Everest Base Camp. Our guide, Indra, is leading the way. 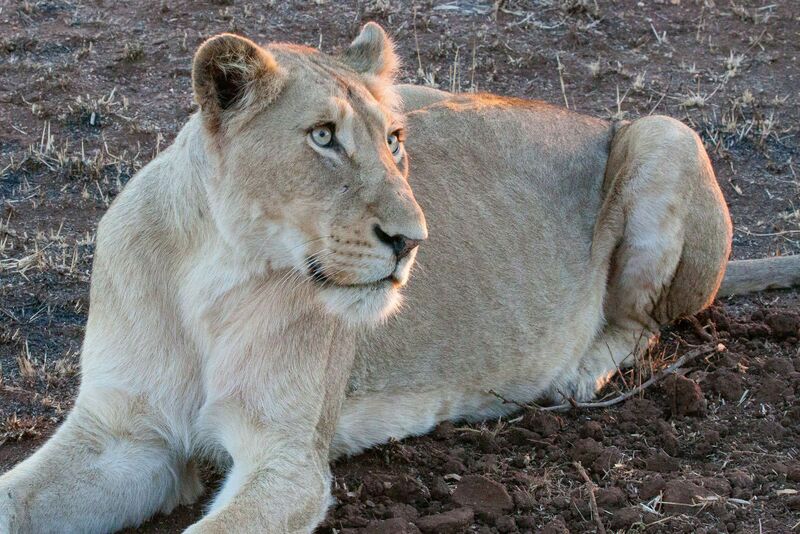 On safari at Kruger National Park in South Africa, we took a sunrise excursion to look for lions and hit the jackpot. Isn’t she a beauty? 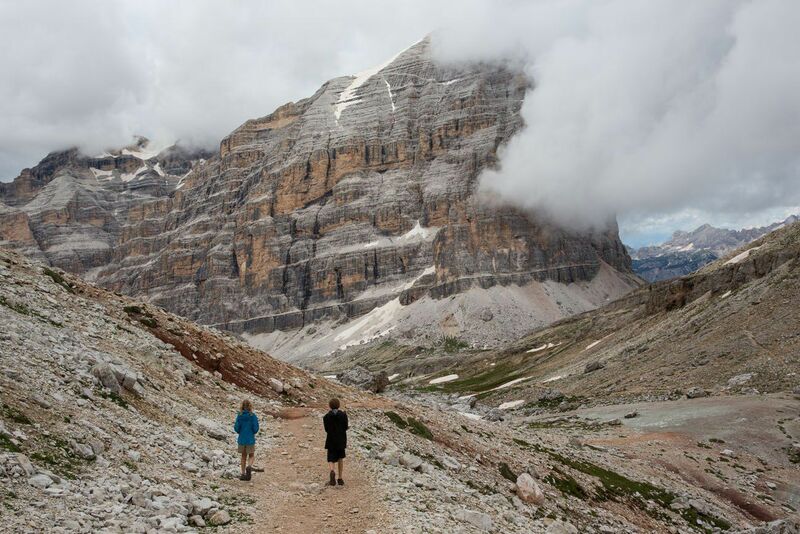 Hiking the Puez-Odle Altopiano in the Dolomites, Italy. 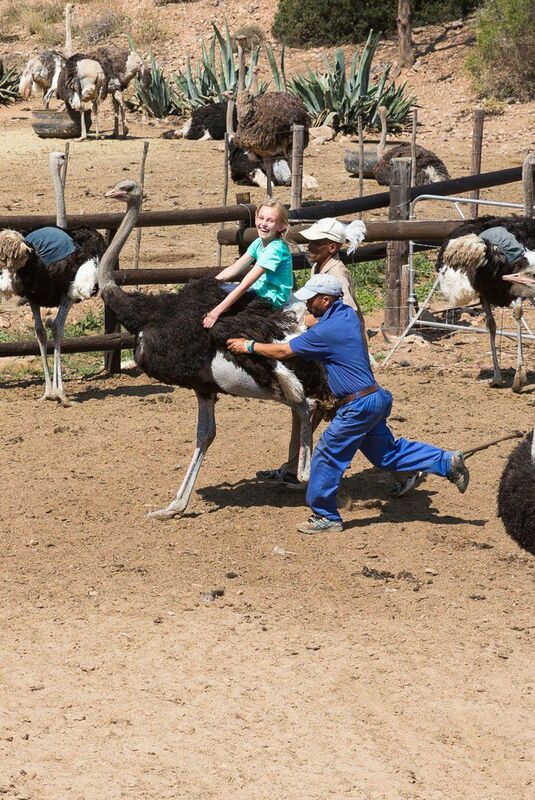 Pure fun…riding ostriches while on the Garden Route of South Africa. 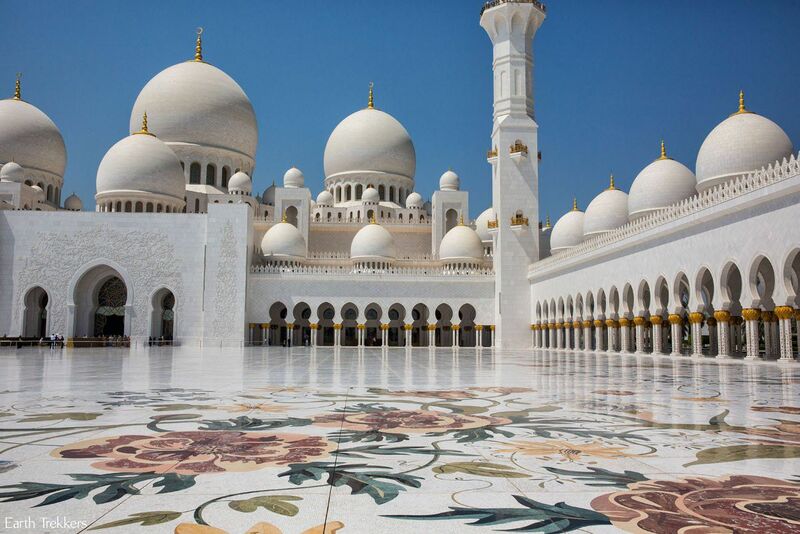 The Sheikh Zayed Grand Mosque in Abu Dhabi, UAE. 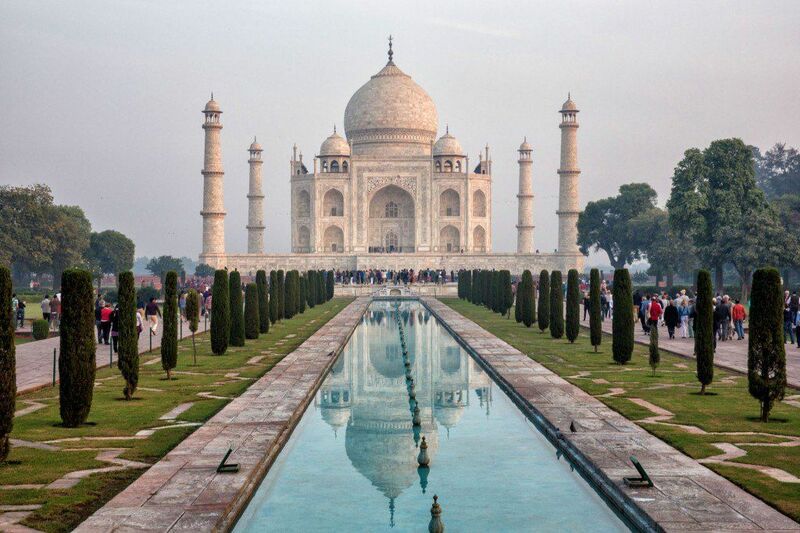 In my opinion, this is the most beautiful building in the world. 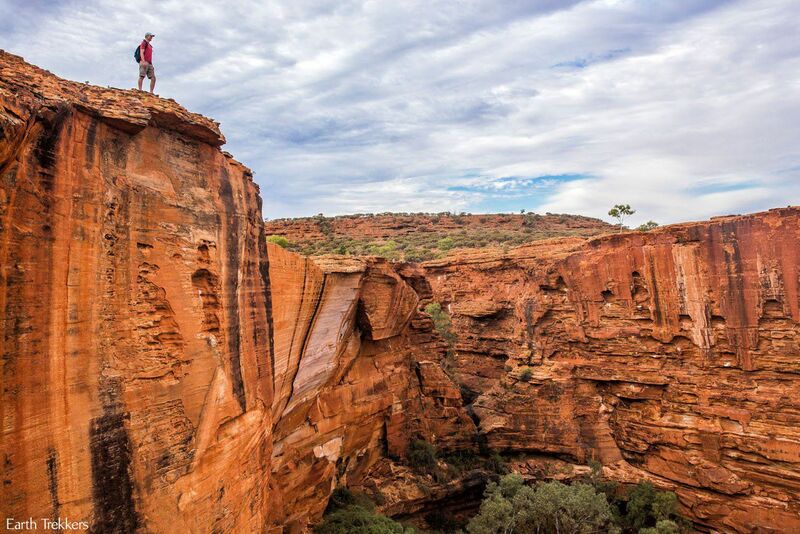 Hiking Kings Canyon in Australia. 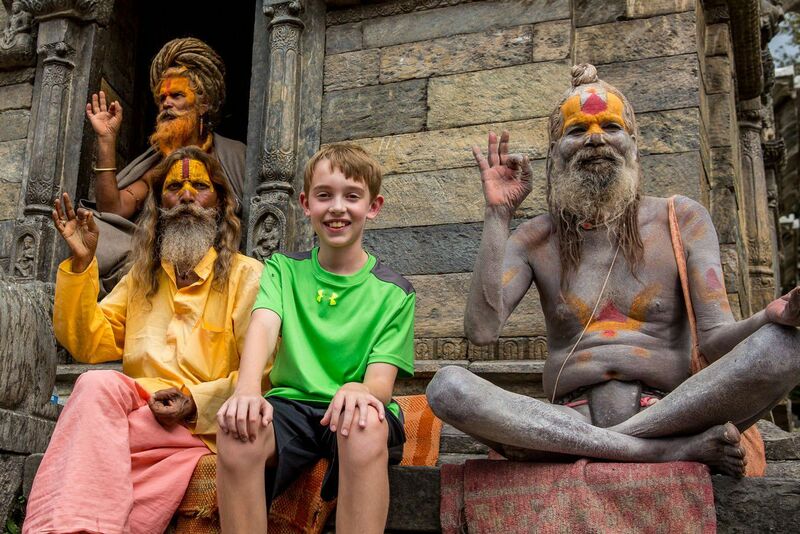 Tyler with the holy men in Kathmandu, Nepal. 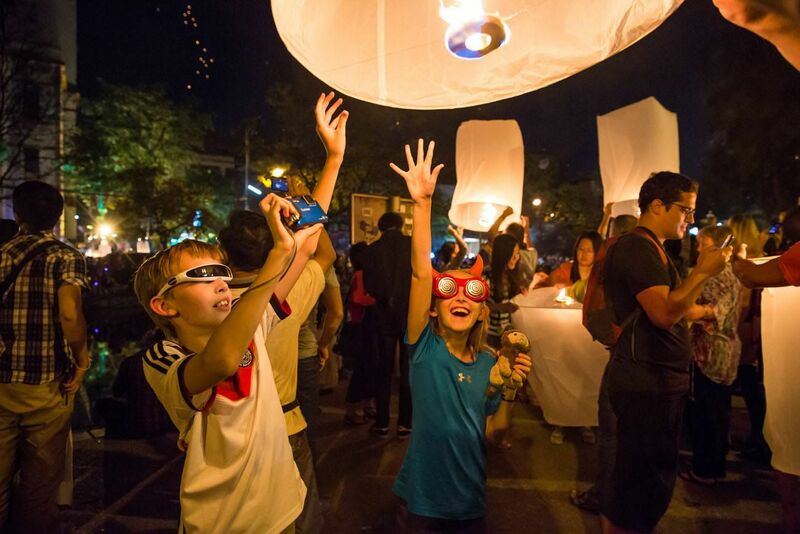 Setting off lanterns on New Years Eve in Chiang Mai, Thailand. 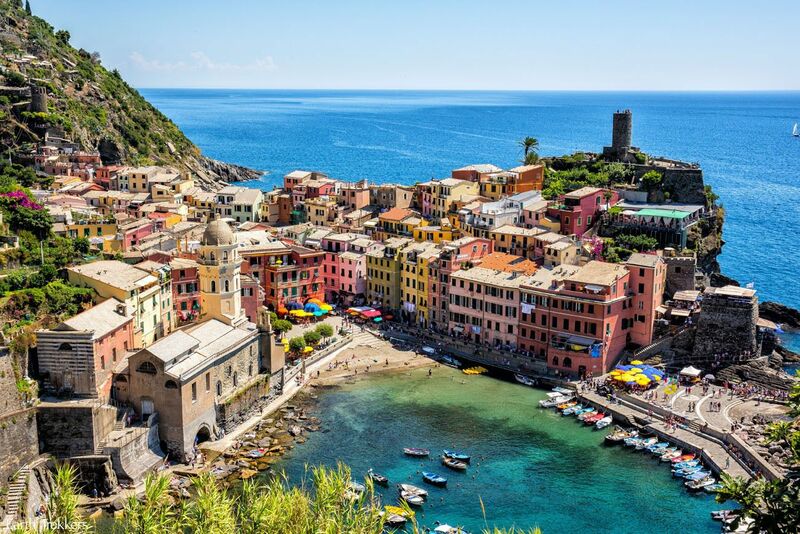 Beautiful Vernazza, one of our favorite views while hiking along the Cinque Terre in Italy. 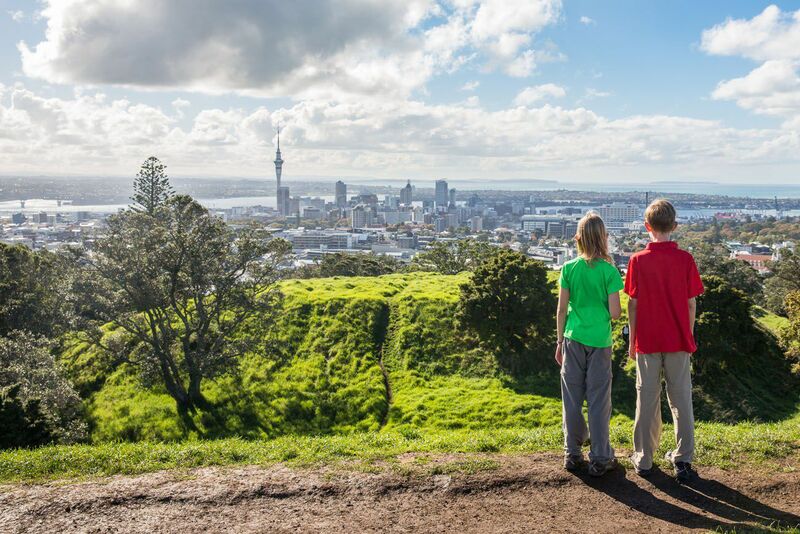 Auckland, New Zealand, a beautiful city in one of the world’s most beautiful countries. 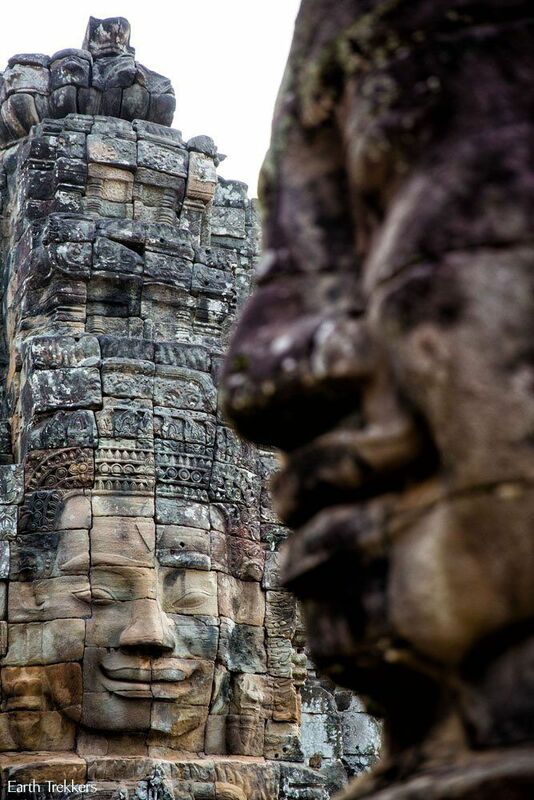 Bayon…I never knew this existed before coming to Siem Reap, Cambodia. The world is full of surprises. 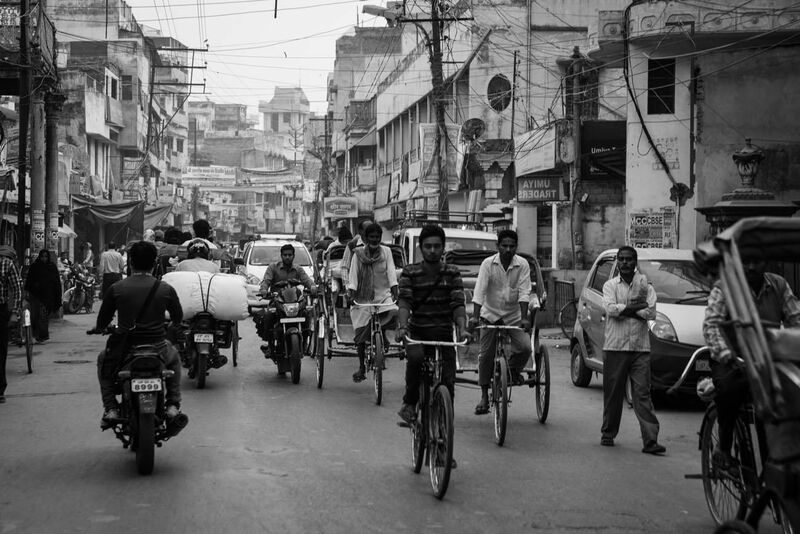 Tuk tuks and motorbikes on the streets of Varanasi, India. 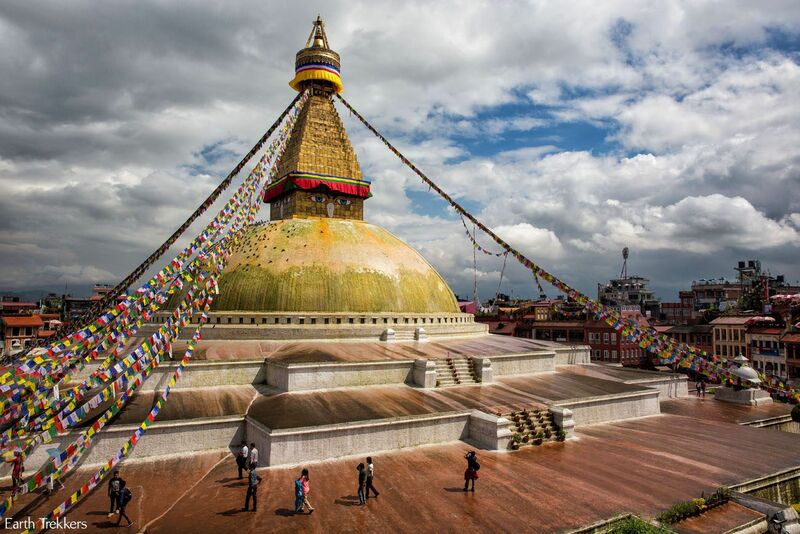 Boudhanath Stupa in Kathmandu, Nepal. This was taken in September 2014. Everything from the face up was destroyed in the earthquakes that hit Nepal in April and May 2015. 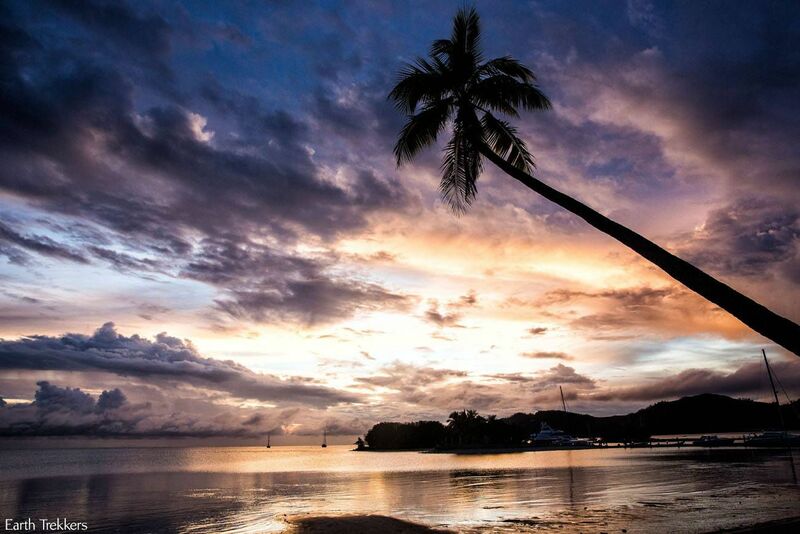 Fiji has the best sunsets. 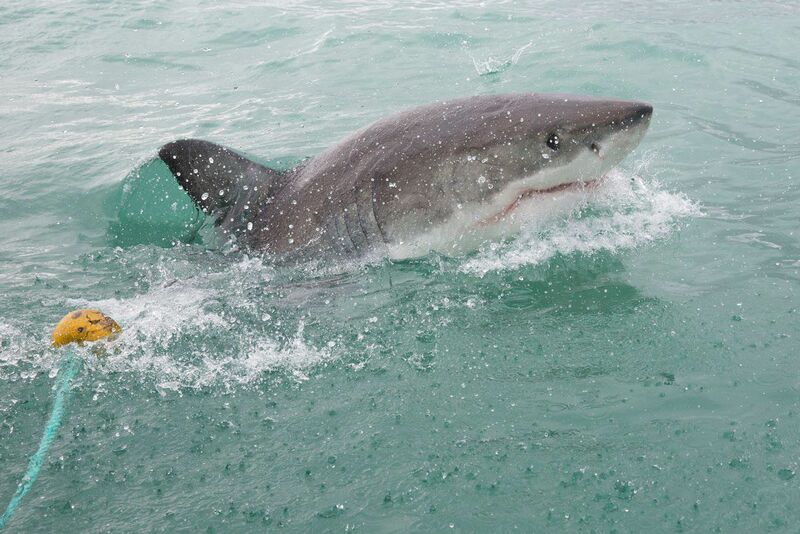 Great White Shark cage diving in South Africa, one of the coolest things we have done. The Shwedagon Pagoda in Yangon, Myanmar. 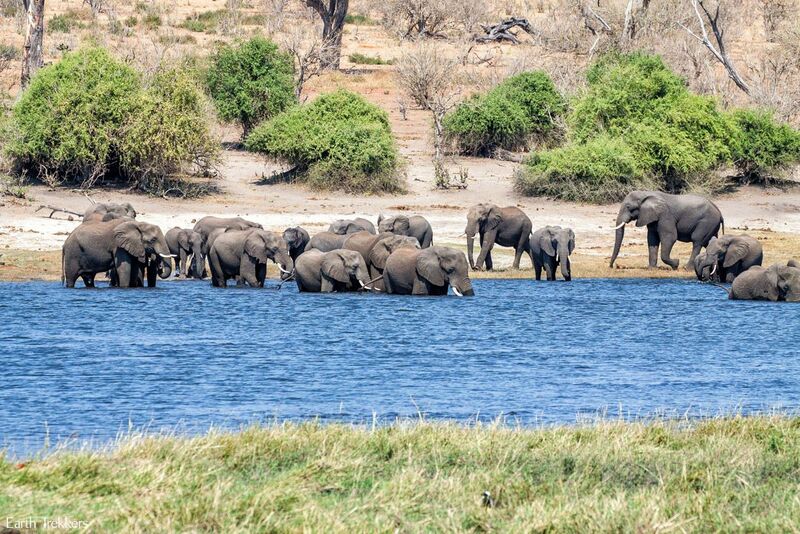 Going on safari at Chobe National Park in Botswana was probably our favorite activity of the entire year. The amount of wildlife we saw was amazing, as was sleeping out in tents at night, hearing lions and other animals off in the distance. 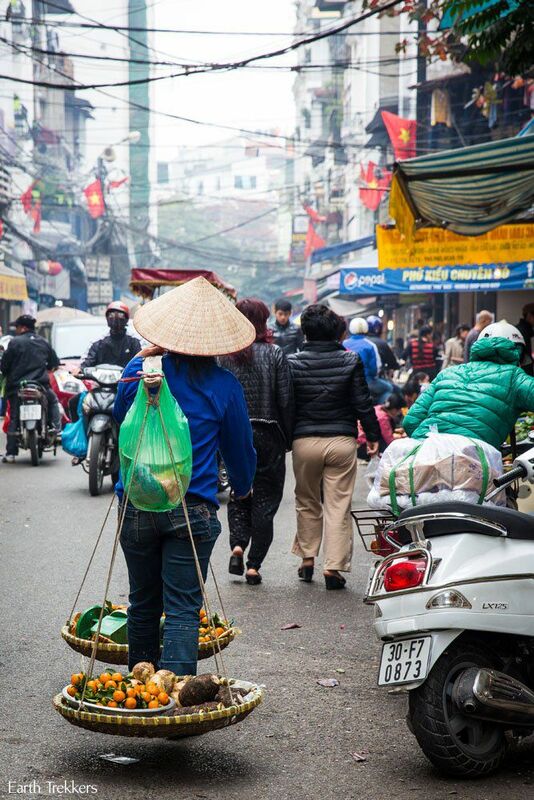 Walking through the streets of Hanoi, Vietnam. 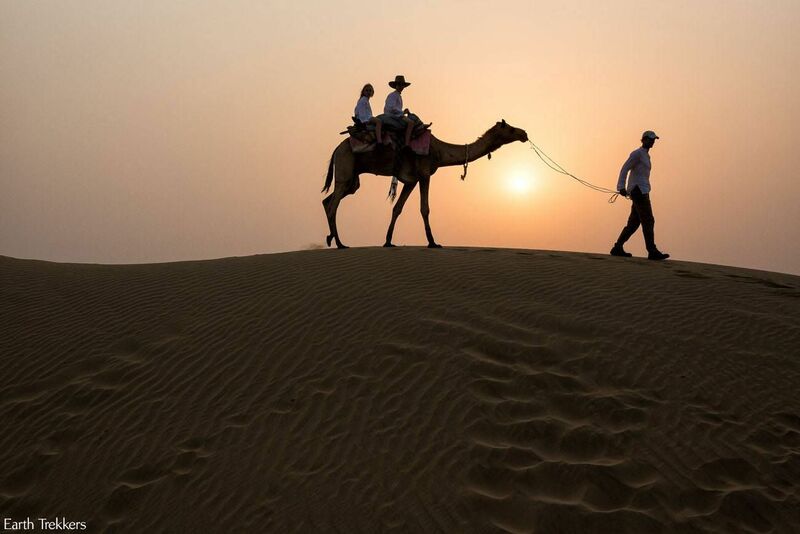 Going on a camel safari in the Indian desert just outside of Jaisalmer. 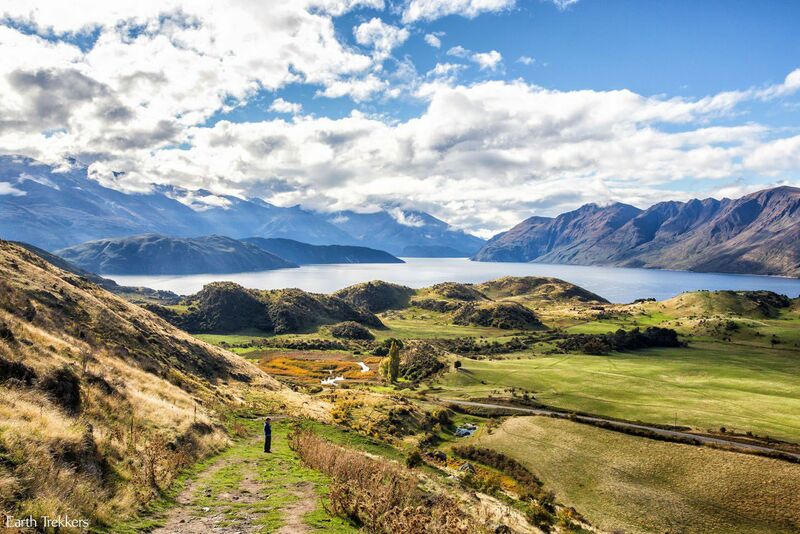 Hiking in Wanaka, New Zealand. 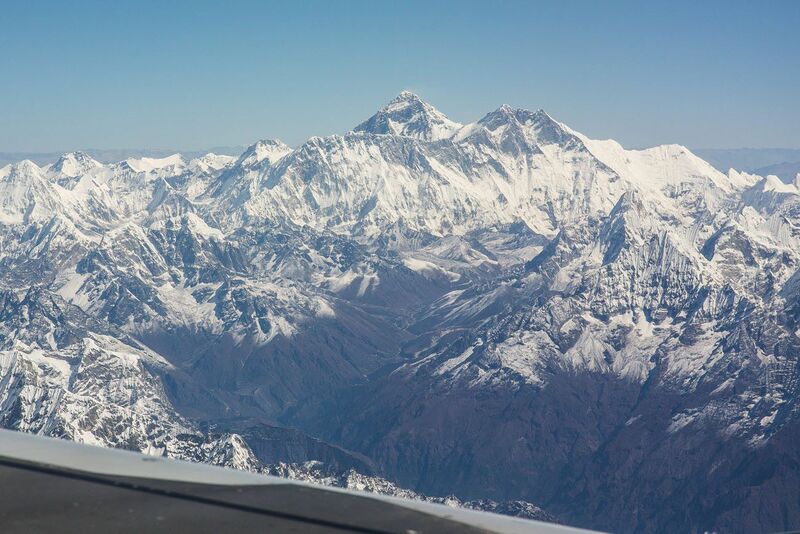 Mt Everest seen from our flight from Kathmandu, Nepal to Paro, Bhutan. 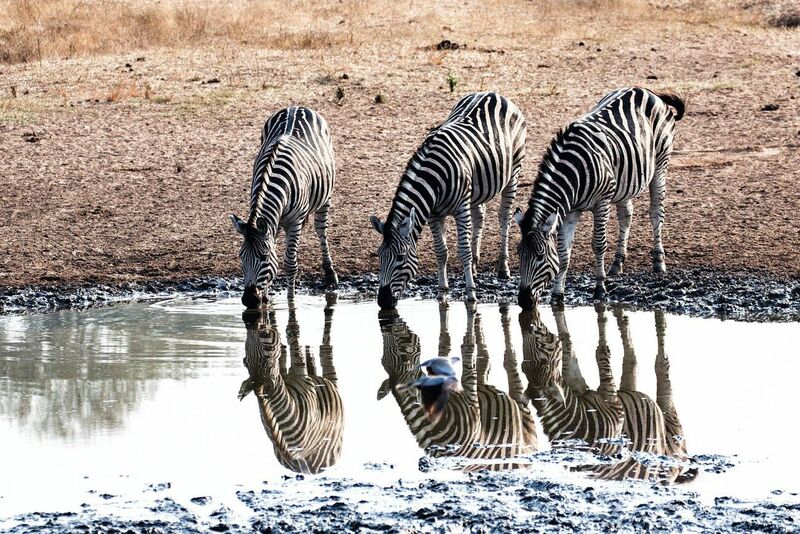 Zebras and their reflections, on safari at Kruger National Park. 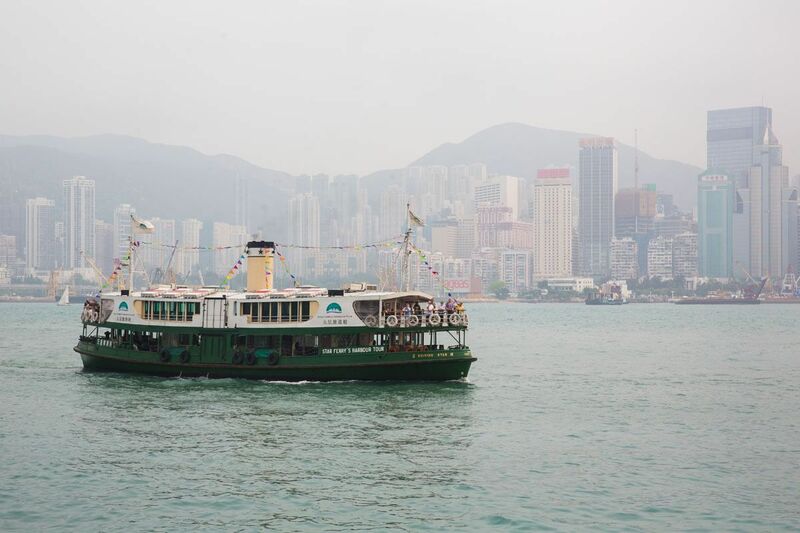 The Star Ferry in Hong Kong. 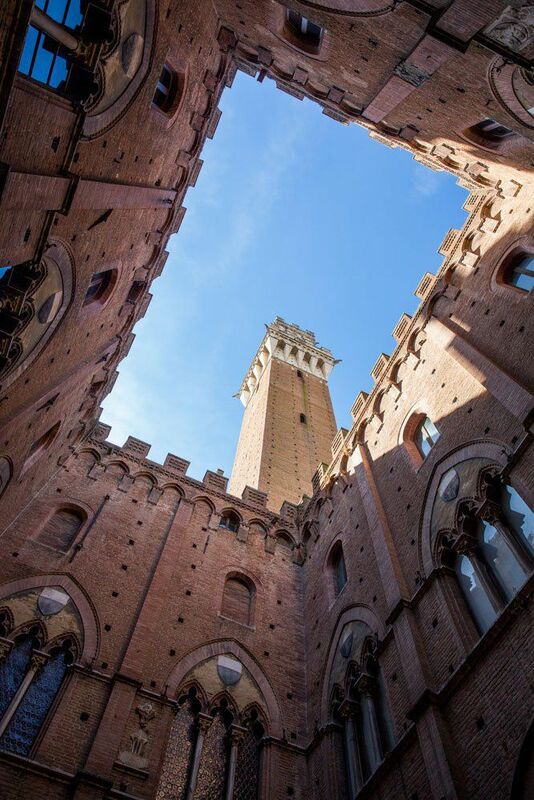 Looking up from the courtyard of the campanile in Siena, Italy. 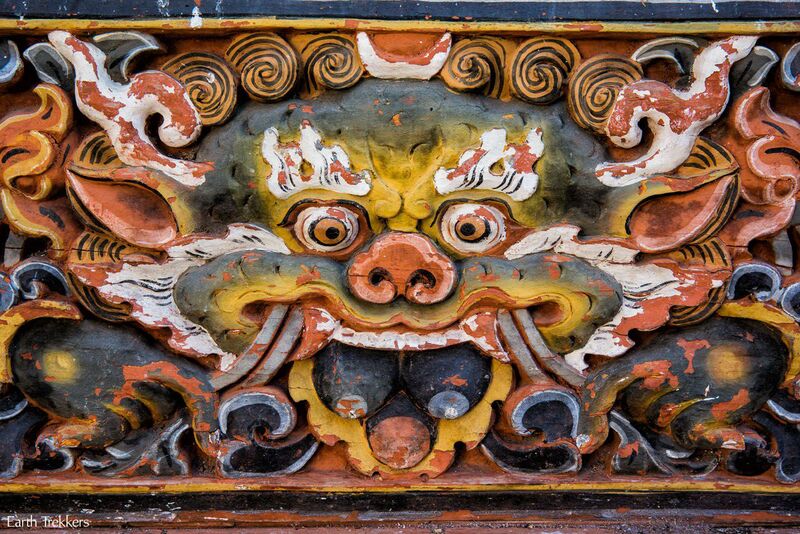 One of many spectacular wood carvings on the buildings in Bhutan. 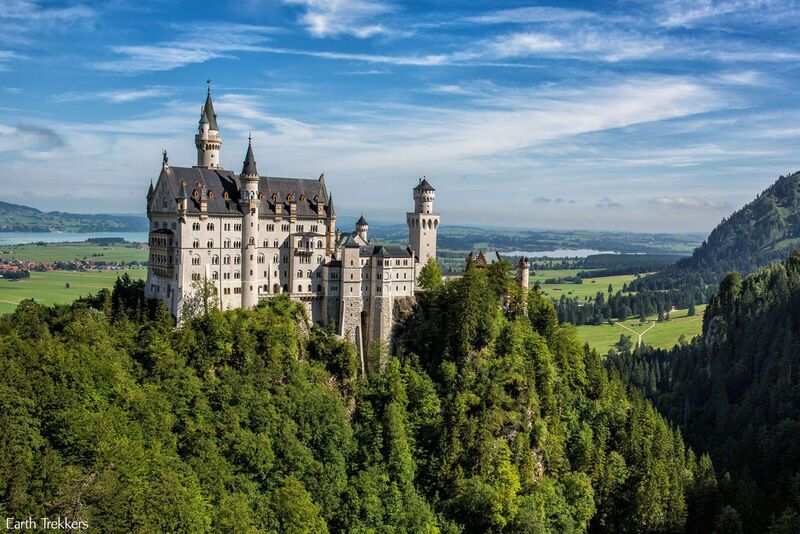 The storybook castle of Neuschwanstein in Bavaria, Germany. 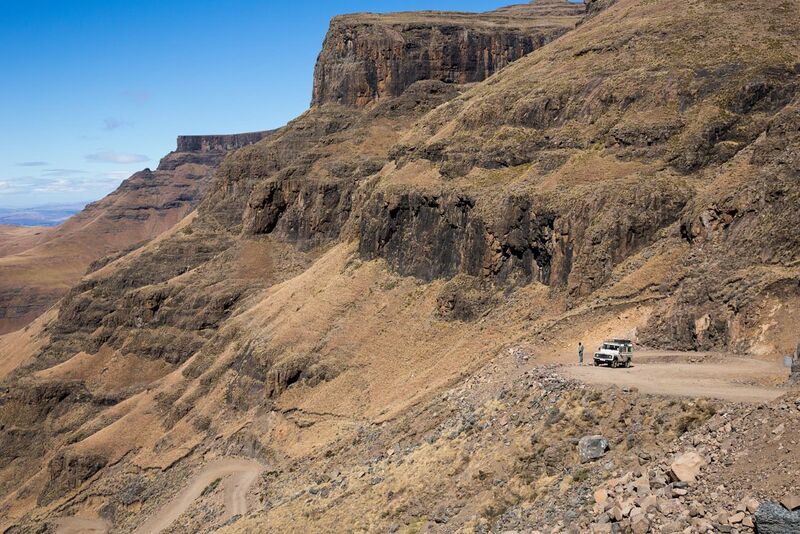 Driving the Sani Pass from South Africa into Lesotho. 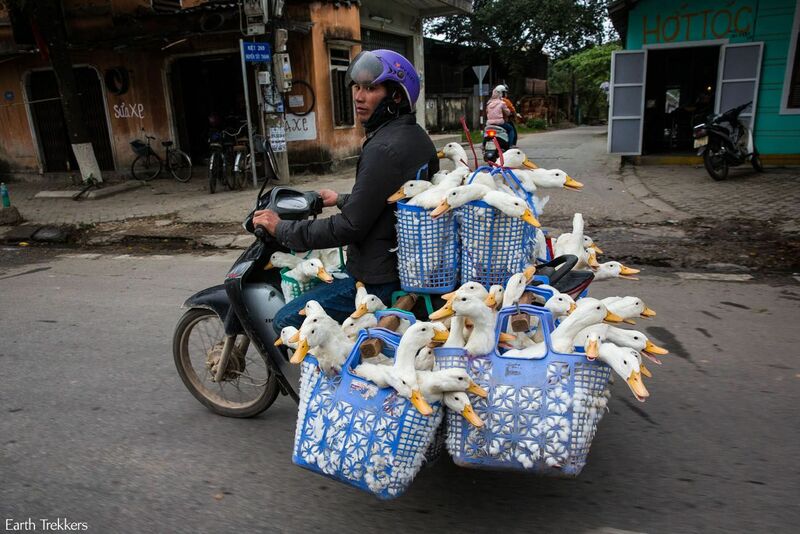 In Vietnam, it is amazing what people carry on their motorbikes. This is one of our favorites. 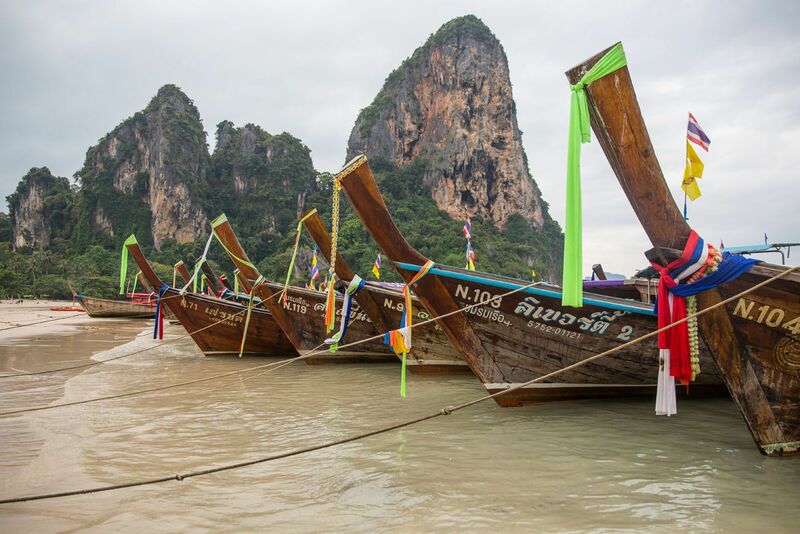 Longtail boats of Krabi, Thailand. 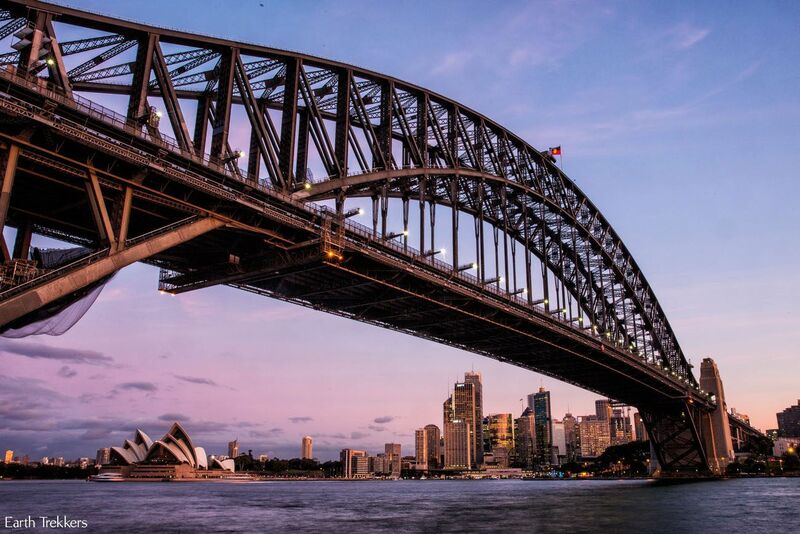 Sunset in the Sydney Harbor, Australia. 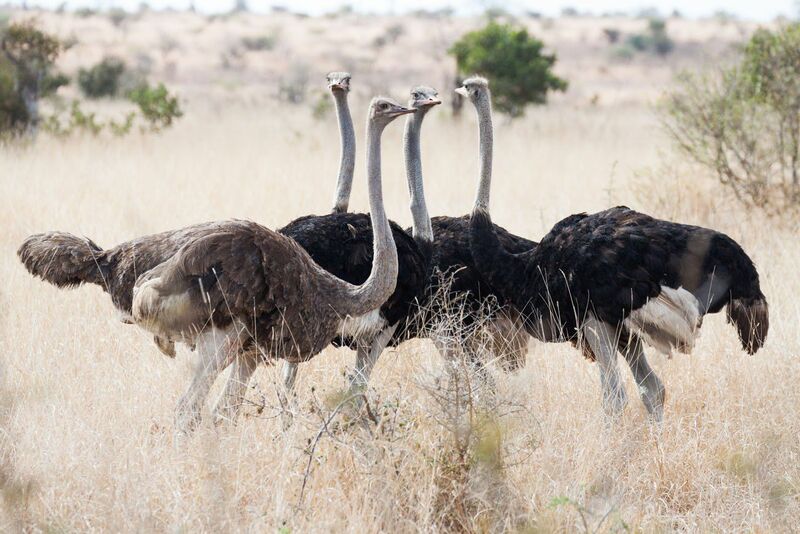 On safari in Kruger National Park again, this time capturing the ostriches who are posing perfectly for a photo. 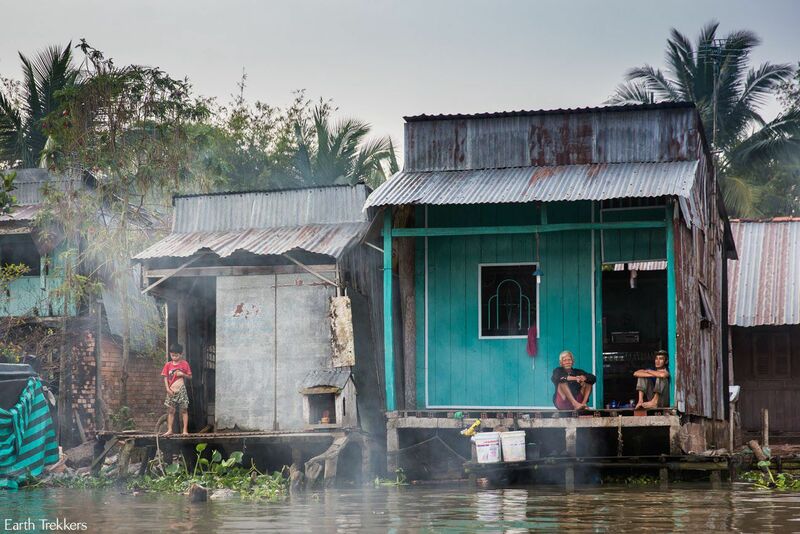 Touring the Mekong Delta in Vietnam. 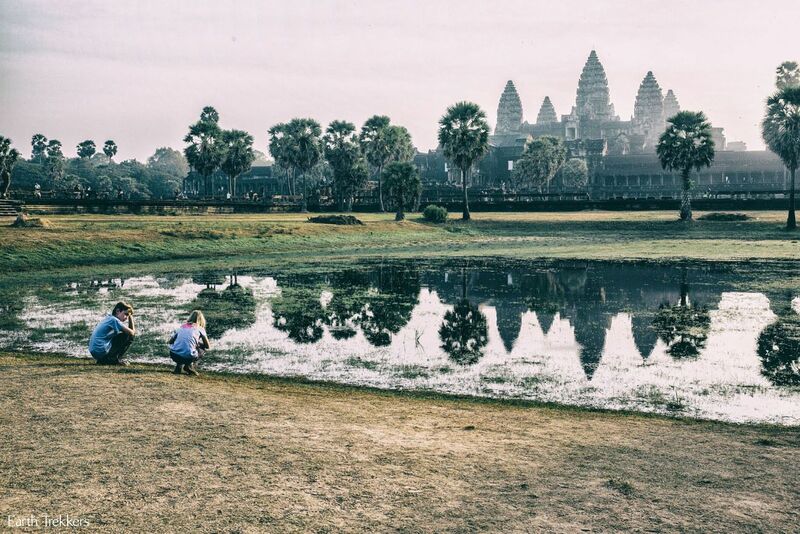 Siem Reap, Cambodia was one of our favorite places we visited. That’s quite a cigar! Meeting the people in Bagan, Myanmar. 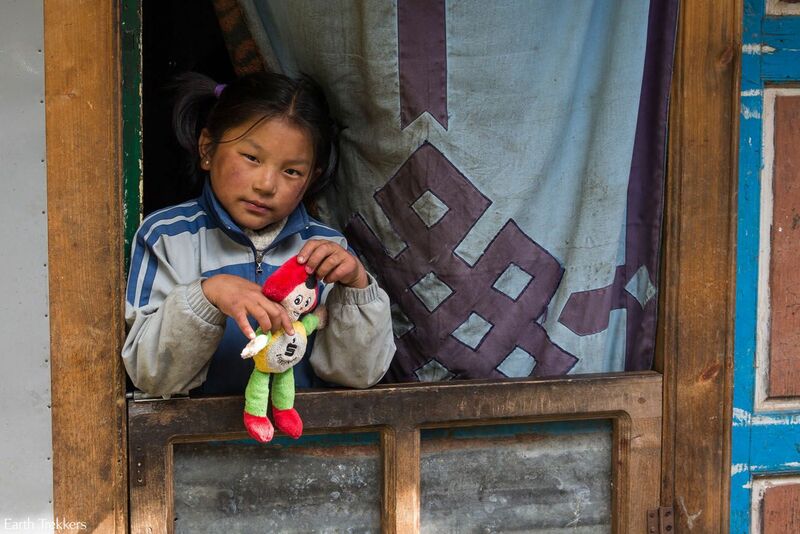 A Nepali girl we passed on our Everest Base Camp Trek, photo taken at Namche Bazaar. 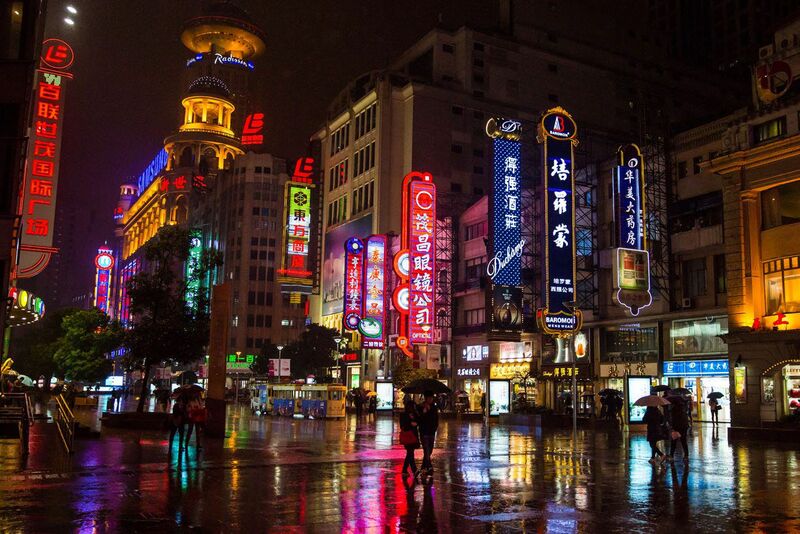 Shanghai is one of the world’s largest and most crowded cities but it sure does clear out when it rains! 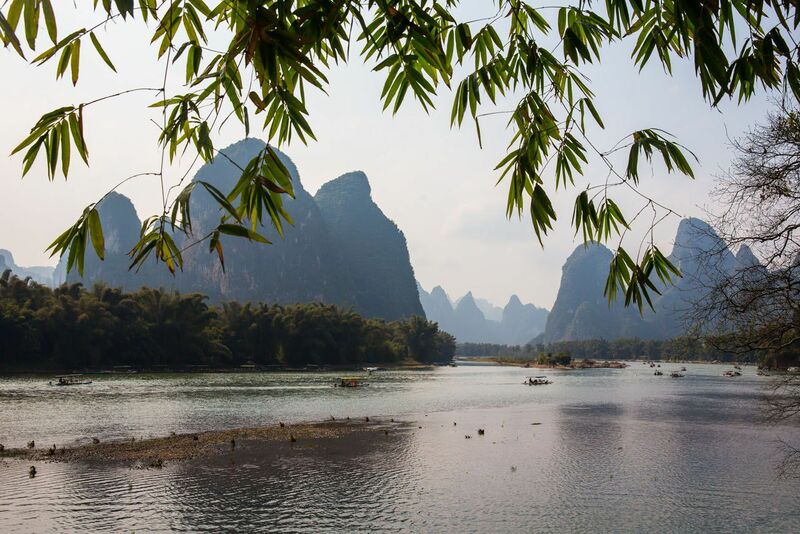 Cycling the Li River Valley in Yangshuo, China. 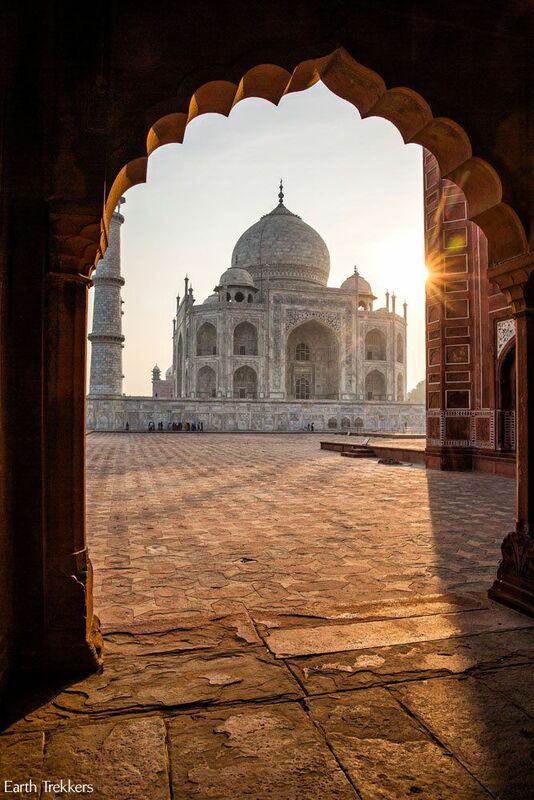 A different perspective of the Taj Mahal. 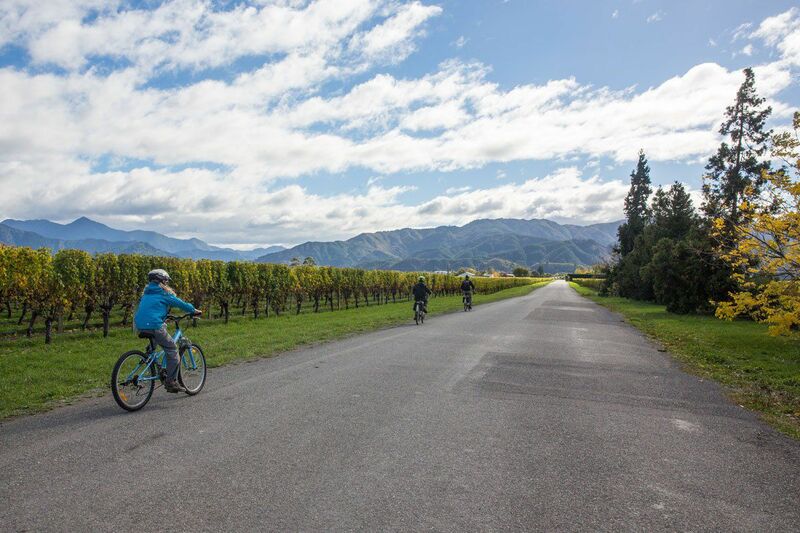 Cycling the Marlborough wine region in New Zealand. 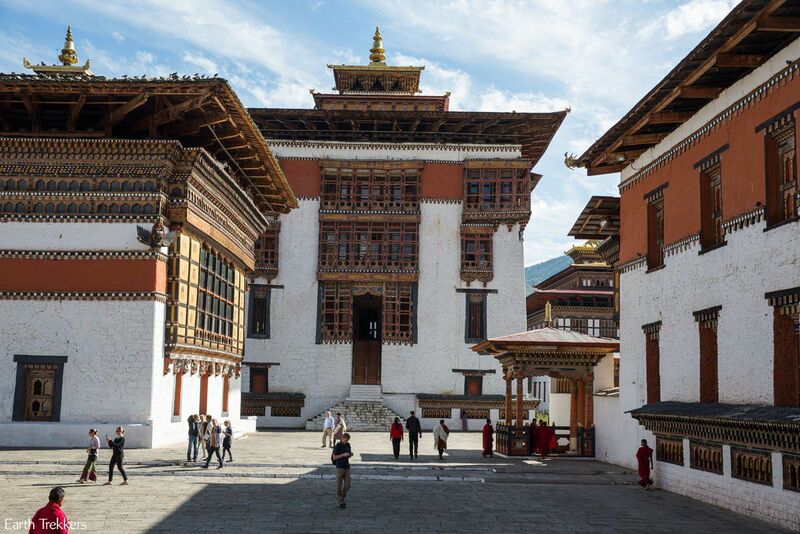 Trashi Chhoe Dzong in Thimpu, Bhutan. 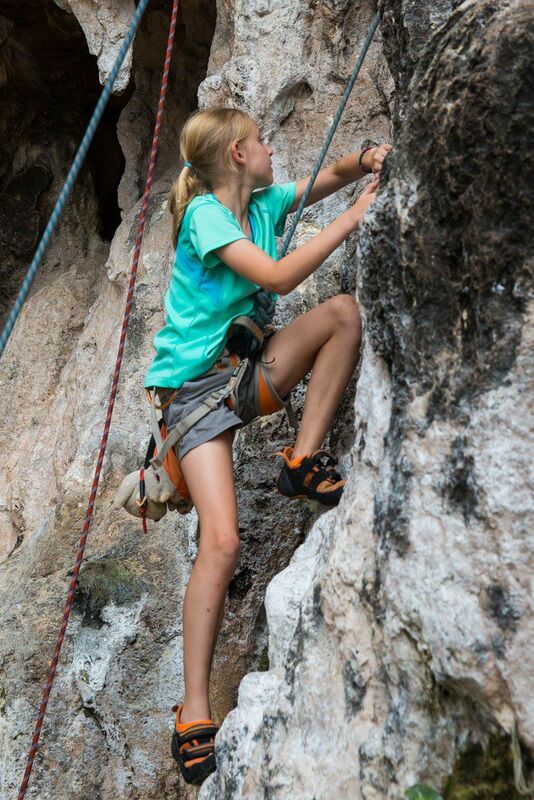 Rock climbing in Krabi, Thailand. Kara was a natural and she may have found herself a new sport to pursue once we are back in Maryland. Angkor Wat through the haze. New Zealand is filled with awe inspiring views. 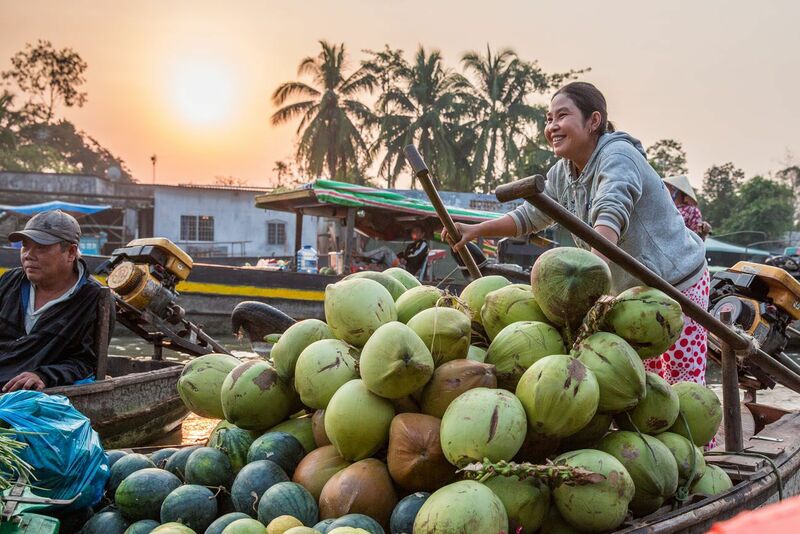 Visiting a floating market on the Mekong Delta, Vietnam. 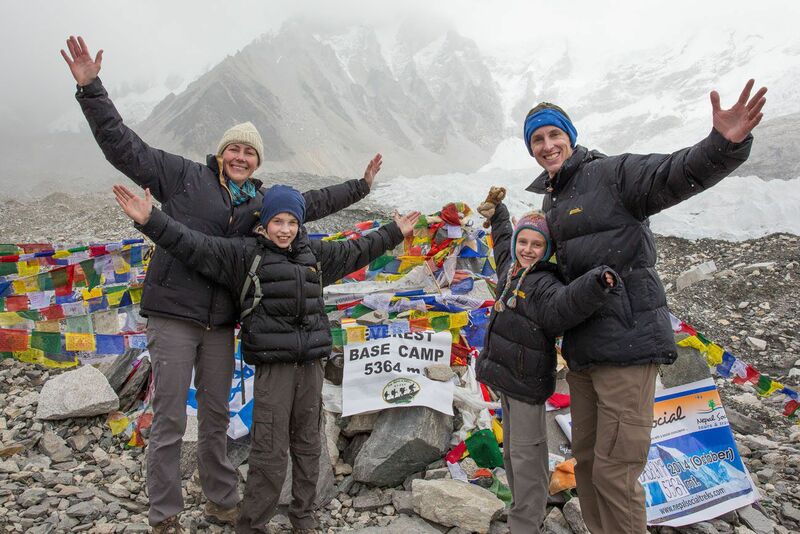 Making it to Everest Base Camp…challenging, rewarding, an accomplishment to be proud of. 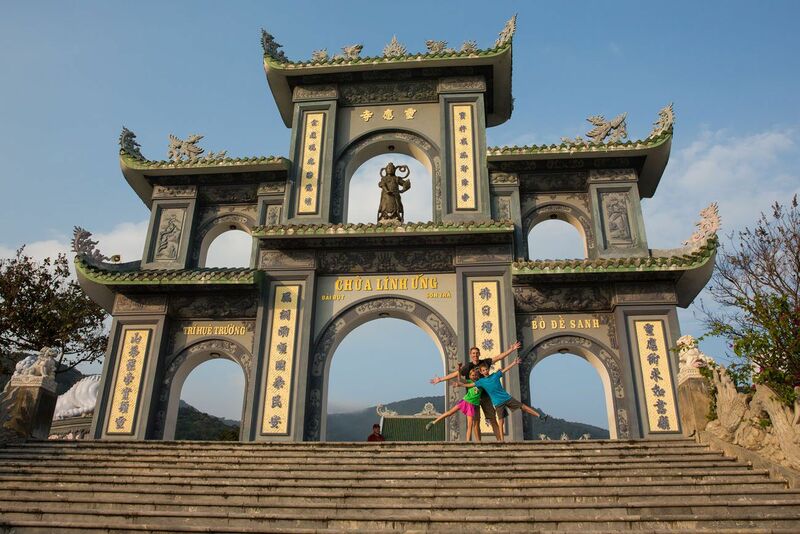 Posing in Da Nang, Vietnam. 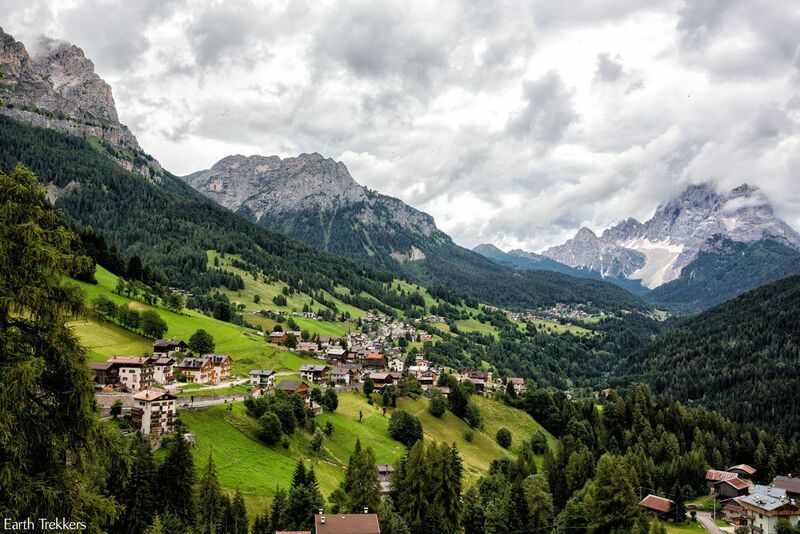 Selva di Cadore, our home base in the Dolomites, Italy. This is a place I want to return to. 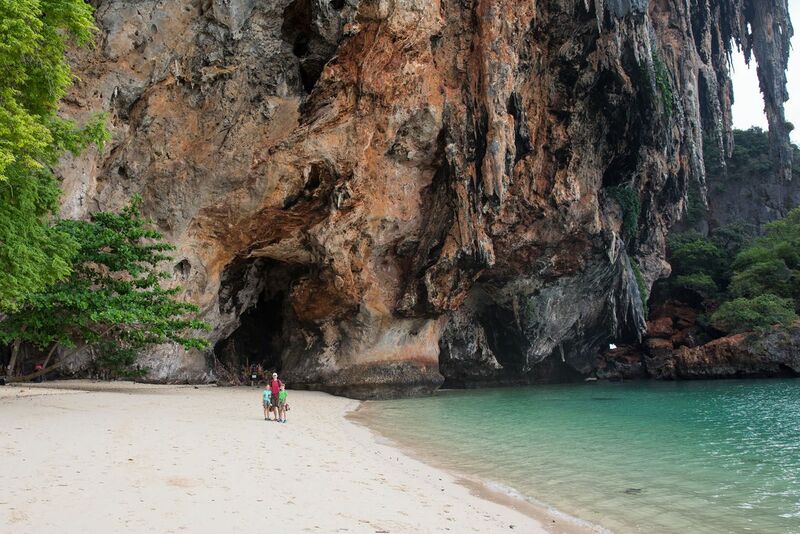 Krabi, Thailand was one of our favorite places…for the rock climbing, island hopping out to Koh Phi Phi, the beaches, and the place where we celebrated Christmas. 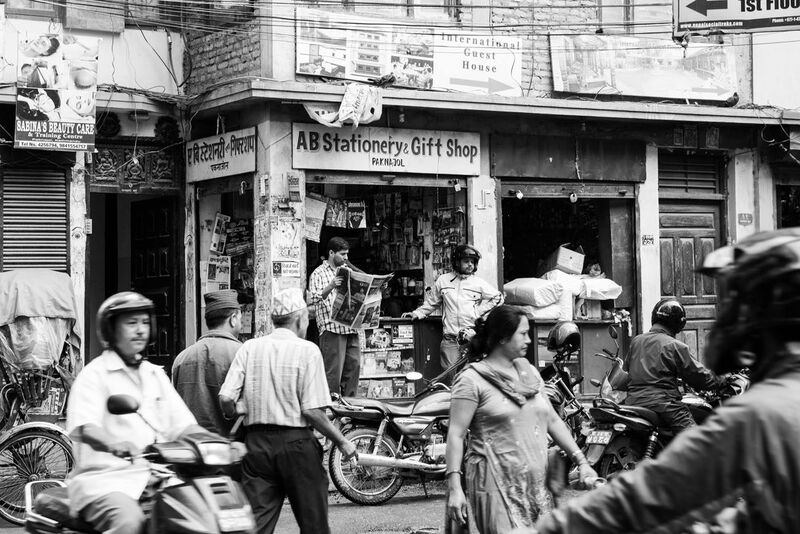 Walking the streets of Kathmandu, Nepal. 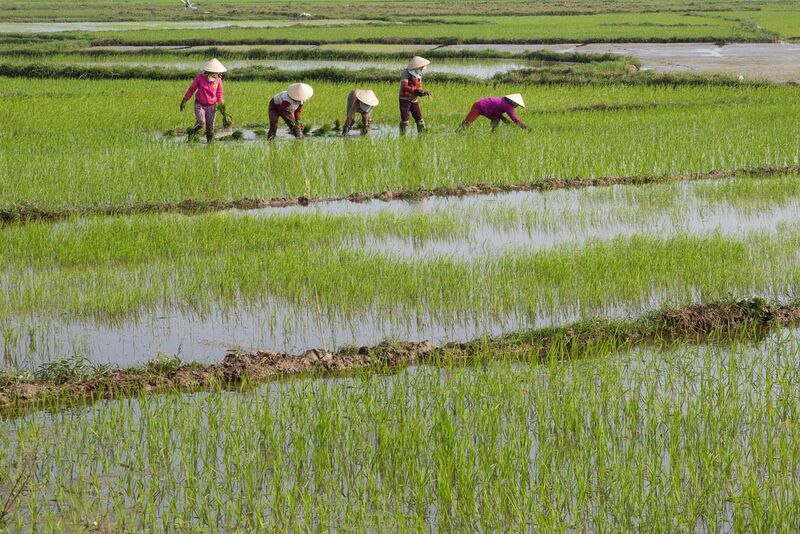 The quintessential Vietnamese scene… rice fields just outside of Hoi An. 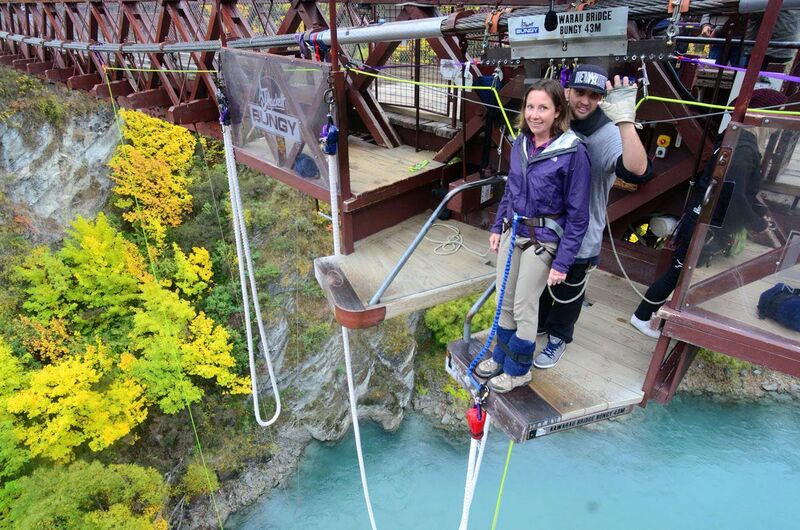 I am so glad Tyler urged us to do this and we all had the courage to go through with it, Bungy jumping in New Zealand. 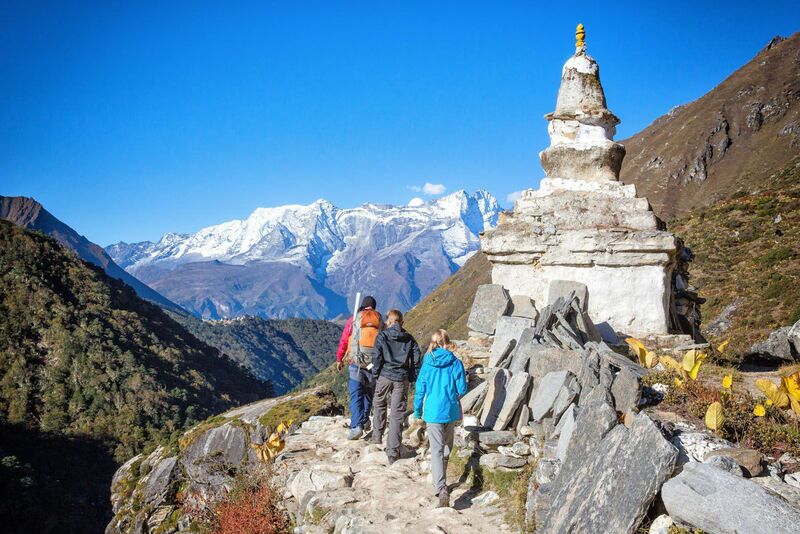 It takes several hours to hike to this viewpoint, the Tigers Nest in Bhutan. 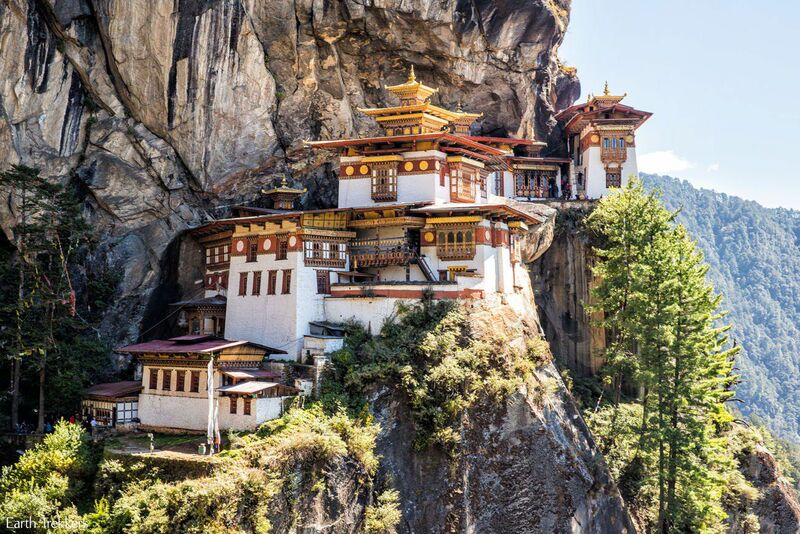 This monastery is built into the cliff walls high above the ground. 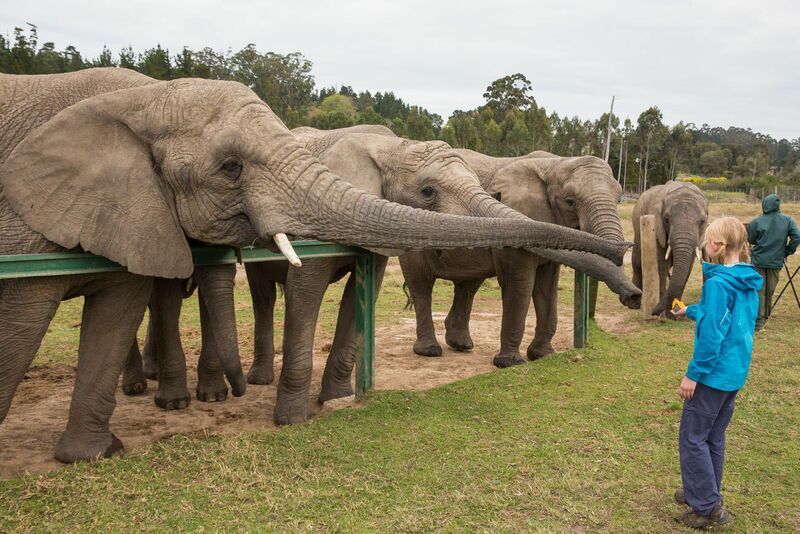 Another favorite memory, feeding the African Elephants just outside of Knysna, South Africa. 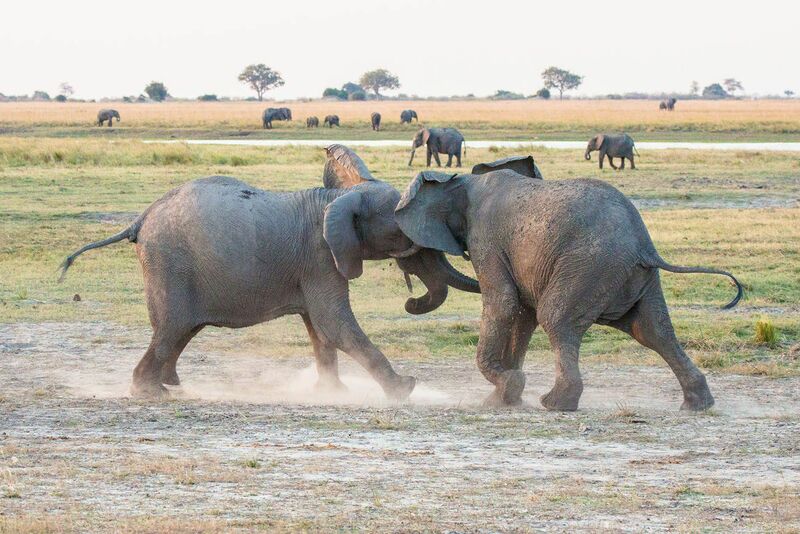 We LOVED this, feeding them fruit, getting slimed, watching these elephants push each other’s trunks out of the way. This was pure fun and after this, no elephant encounter in Asia even came close to just how awesome this was. This is paradise. 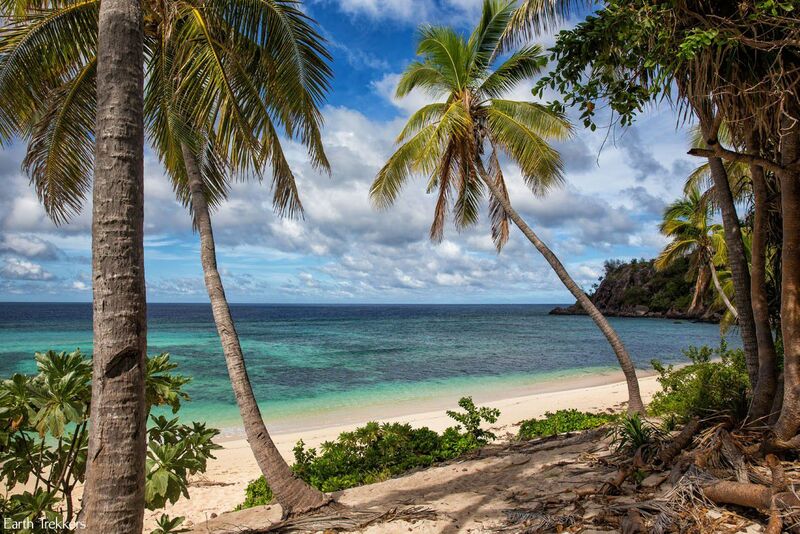 Modriki Island, Fiji. While driving through the South Island of New Zealand, it is hard to go far without stopping to take yet another photograph. 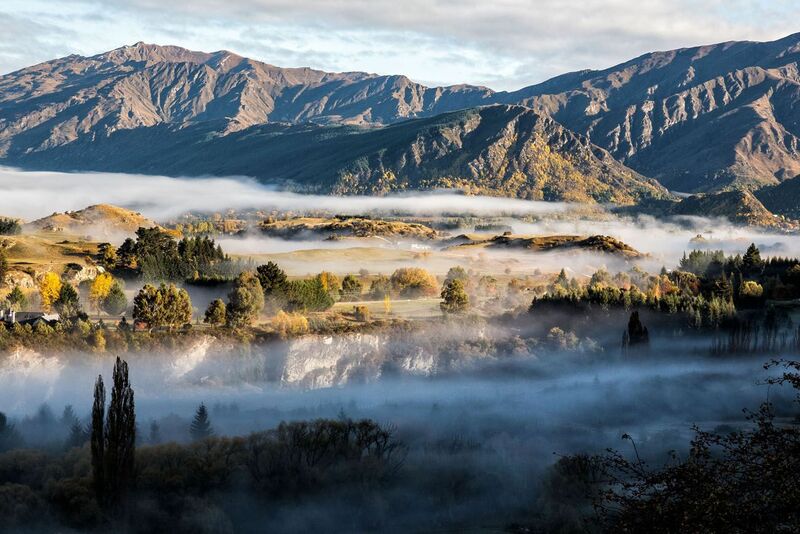 We caught the morning mist perfectly when driving from Queenstown to Wanaka. 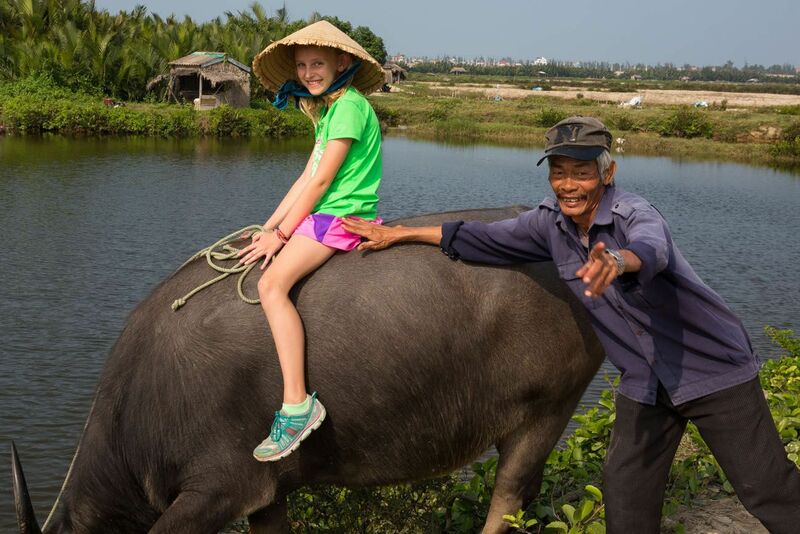 What’s better than meeting a Vietnamese man and his buffalo? Getting a chance to sit on it, too. 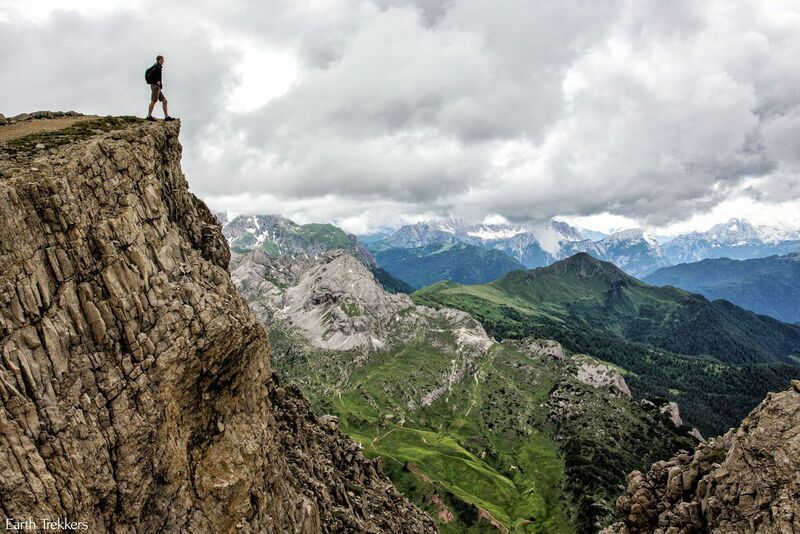 Tim’s view while hiking through the Dolomites, Italy. 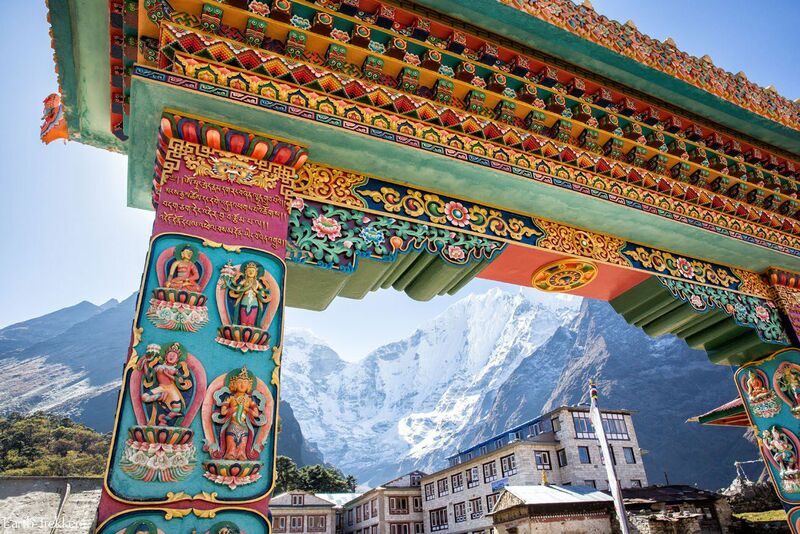 Entrance to a Buddhist monastery while trekking to Everest Base Camp in Nepal. It was always wonderful having our Moms join us. 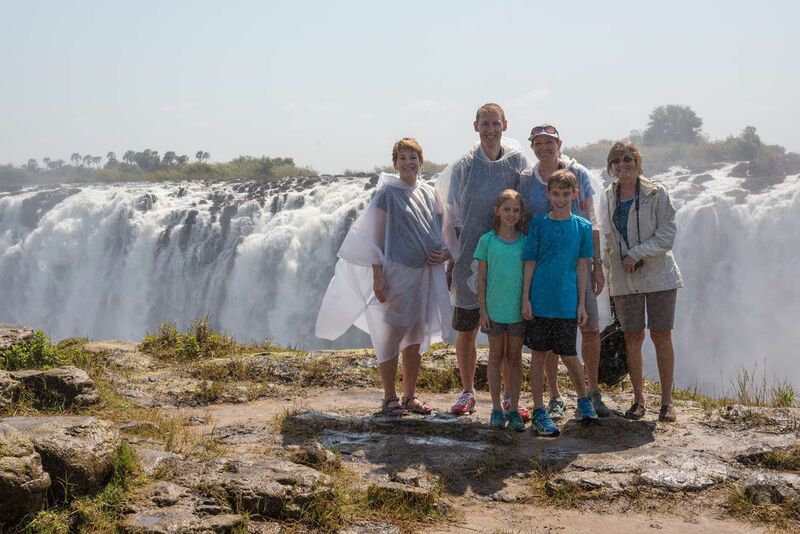 Here we are at Victoria Falls, Zimbabwe. 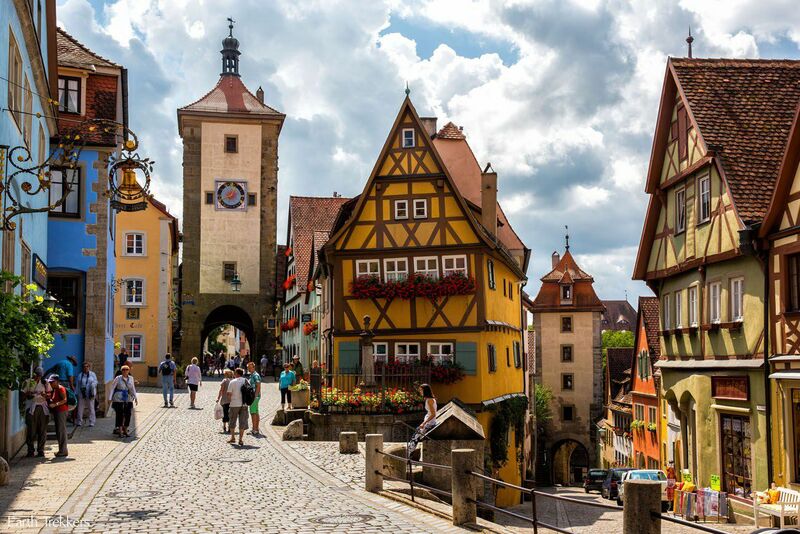 It’s so colorful and perfect that it is hard to believe it’s real…Rothenburg, Germany. 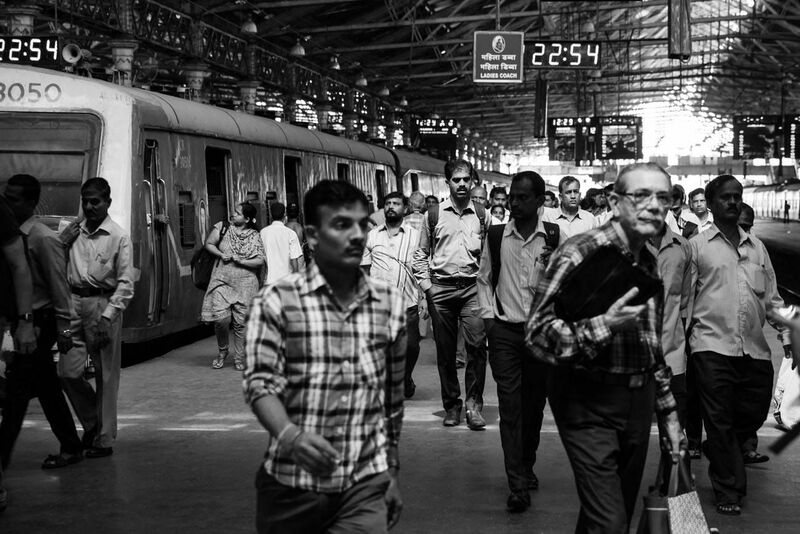 Victoria Terminus train station in Mumbai, India. I spy only two women. Another hike through the Dolomites. 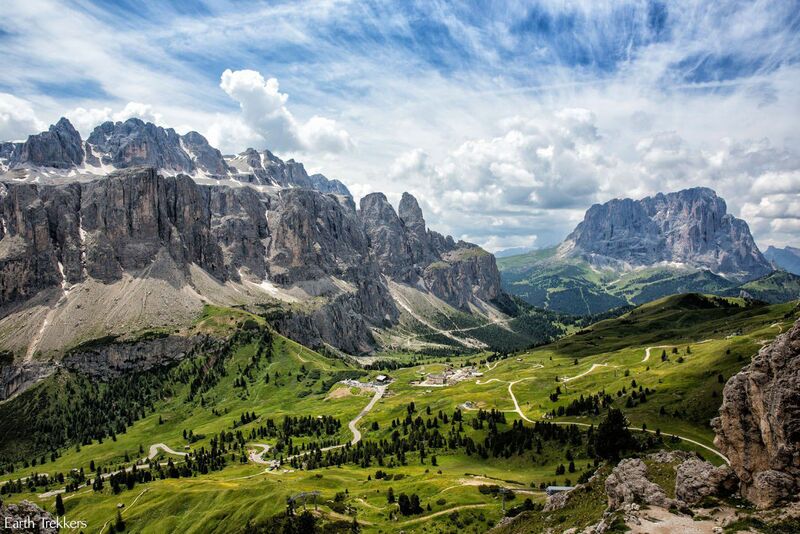 Other than Norway, the Dolomites in Italy is our favorite place in the world to go hiking. 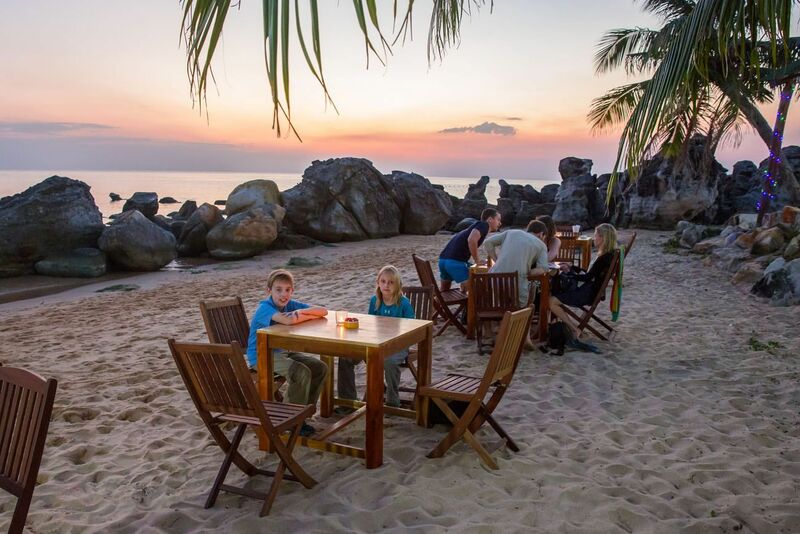 The only good thing about Phu Quoc Island, Vietnam, was our sunset dinner on the beach. We dined on fresh grilled fish and drank Saigon beer. 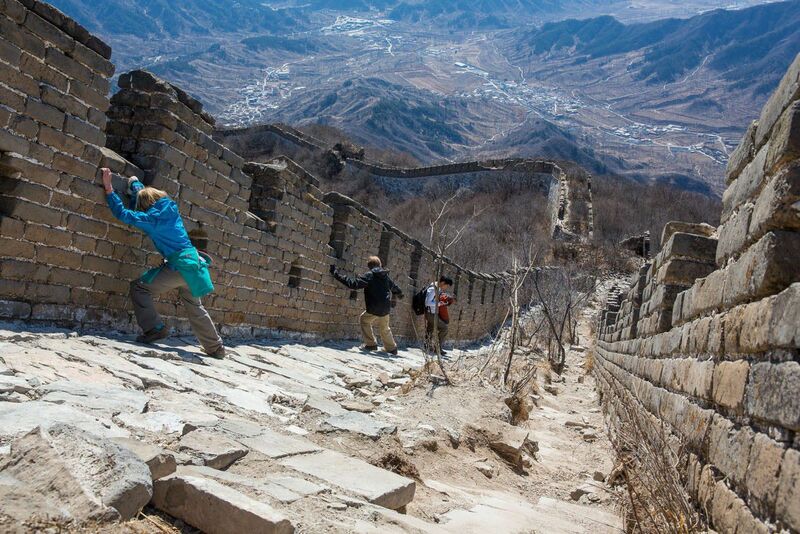 Sliding down the Great Wall of China. 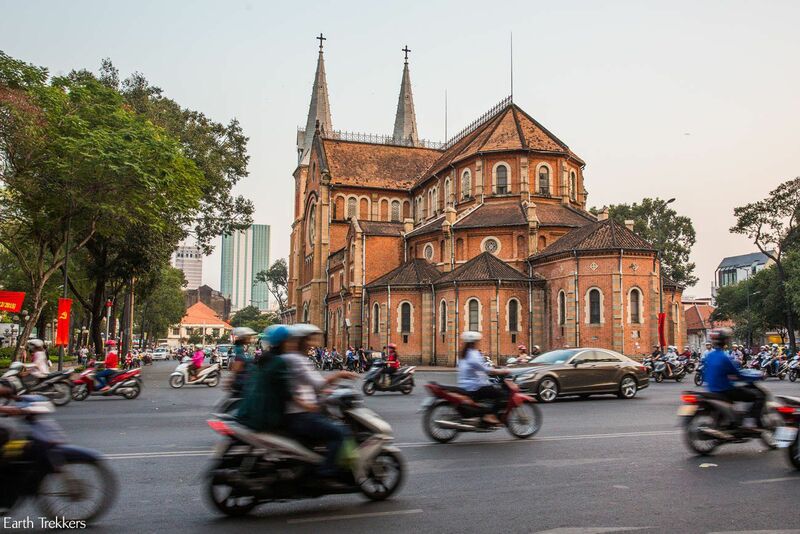 Motorbikes and European architecture in Ho Chi Minh City, Vietnam. 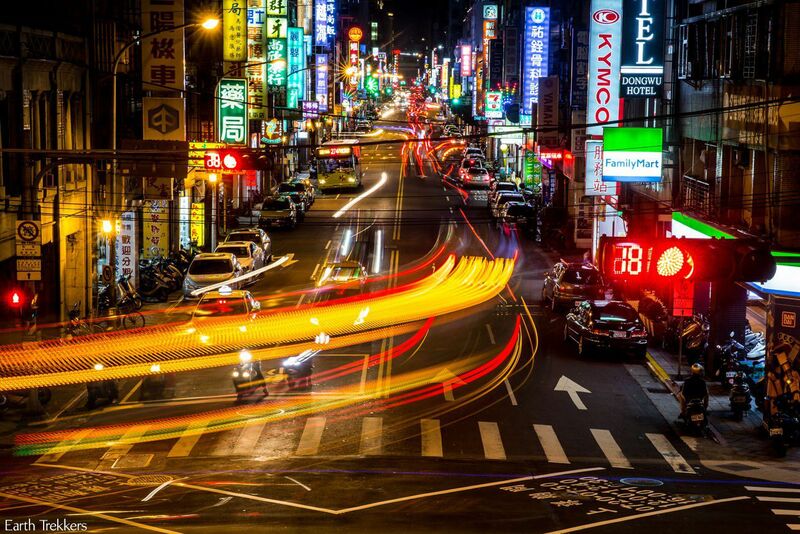 Nighttime city scene in Taipei, Taiwan. 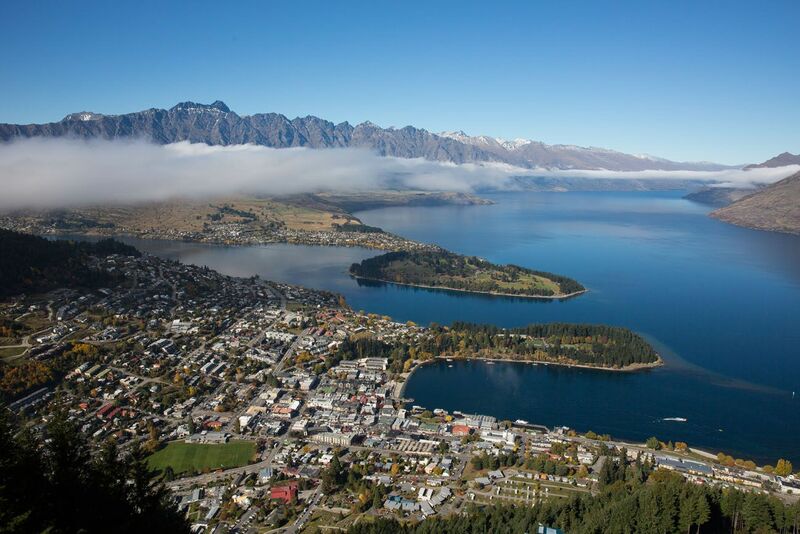 Queenstown, New Zealand, one of our favorite cities. 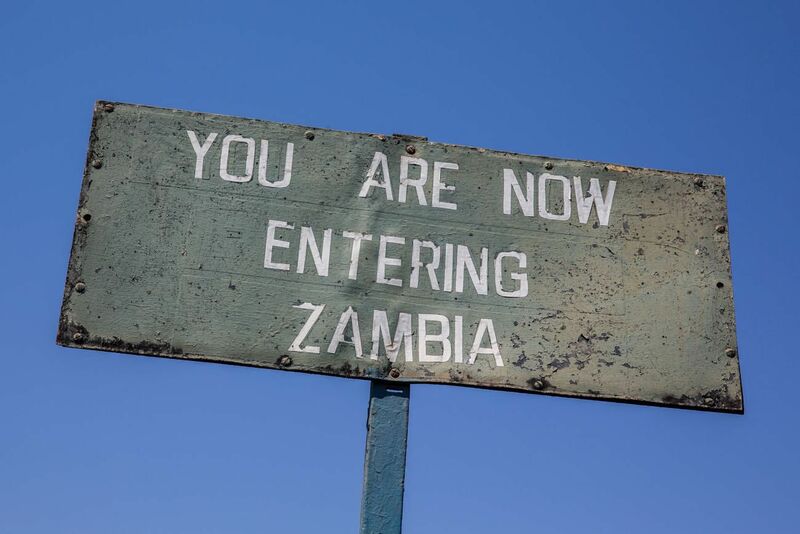 This is where we got our “crazy” on, bungy jumping, jet boat riding, and paragliding. 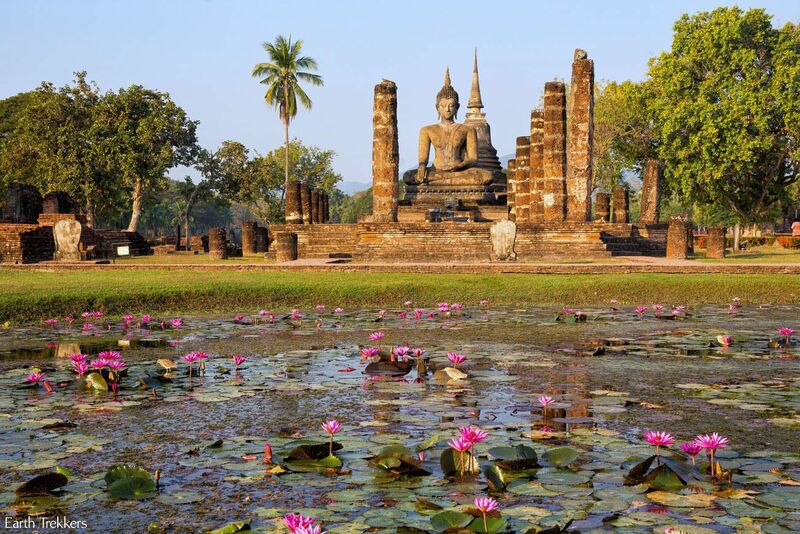 Visiting some of the best ruins in Thailand, Sukhothai. 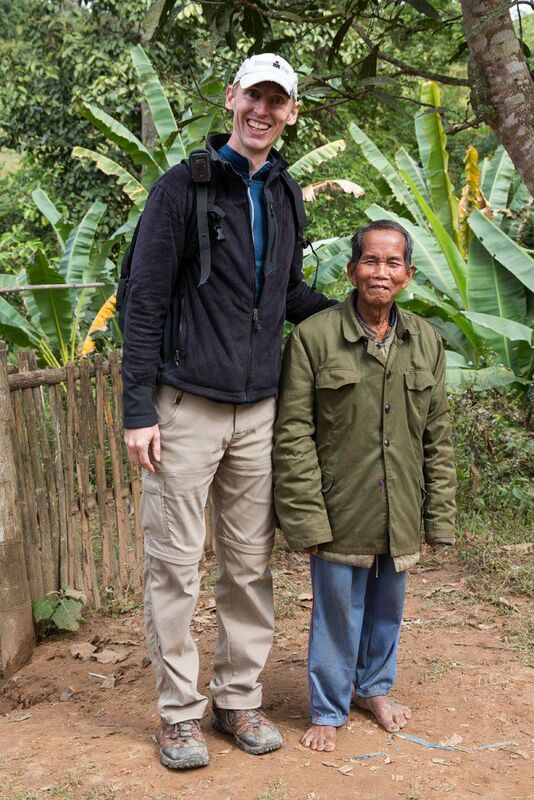 Tim’s towering height was fairly common all over Asia. This photo was taken at a village in Laos. 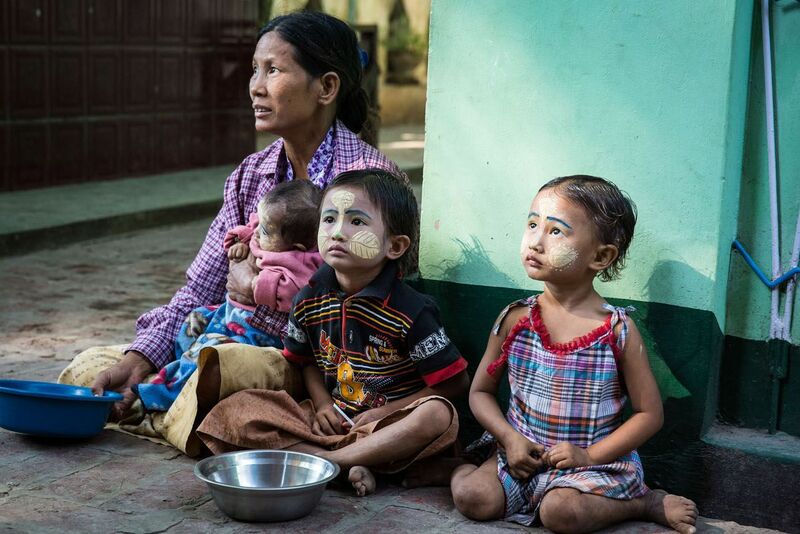 We could not resist giving money to this family, just outside of Mandalay, Myanmar. 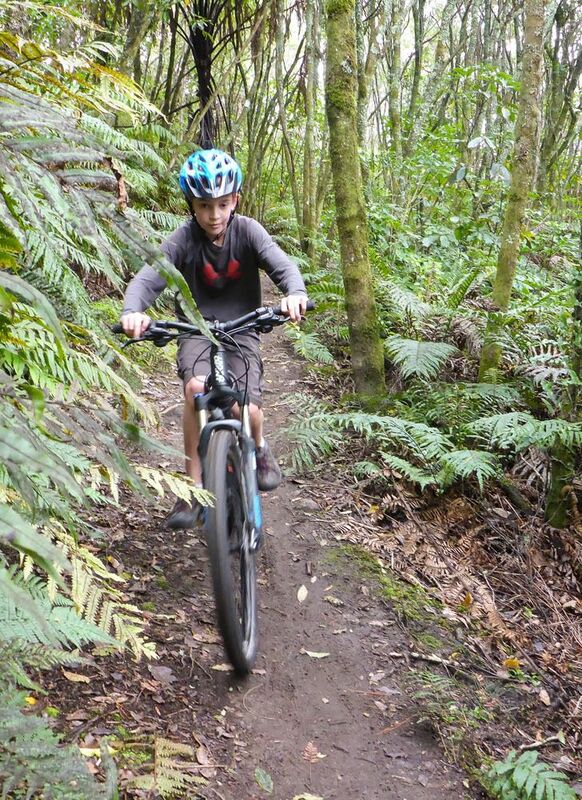 Mountain biking in New Zealand. 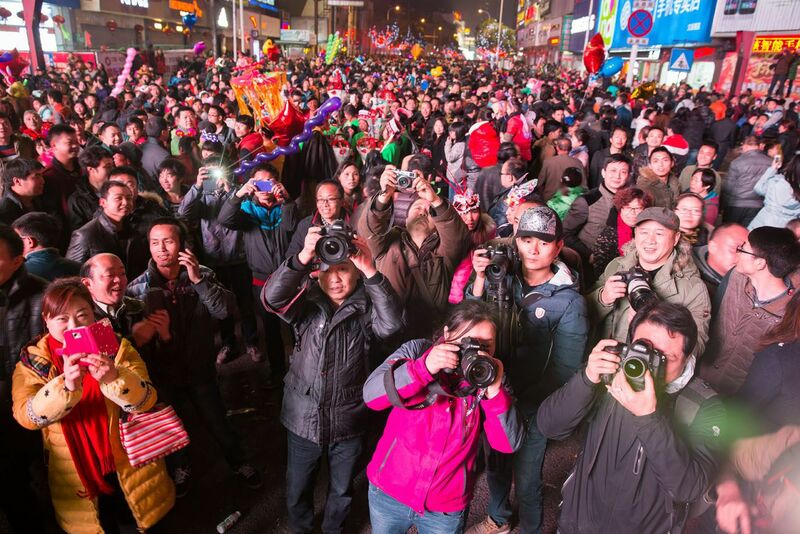 A surprise moment came in Zhangjiajie, China during the Lantern Festival. Tim and I went out, curious about the festivities. I stood on a stepladder in order to take photos of the crowd, not at all expecting to become the main attraction. We were literally the only caucasian people here which attracted tons of attention everywhere we went in town. Tonight, with my position up on the stepladder, all eyes and cameras turned towards me and I got my five minutes of fame. 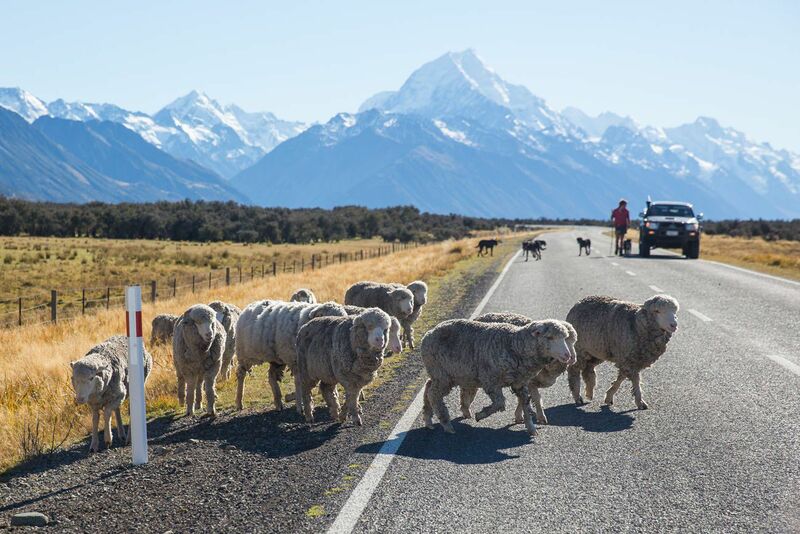 Sheep crossing in New Zealand with Mt Cook in the background. 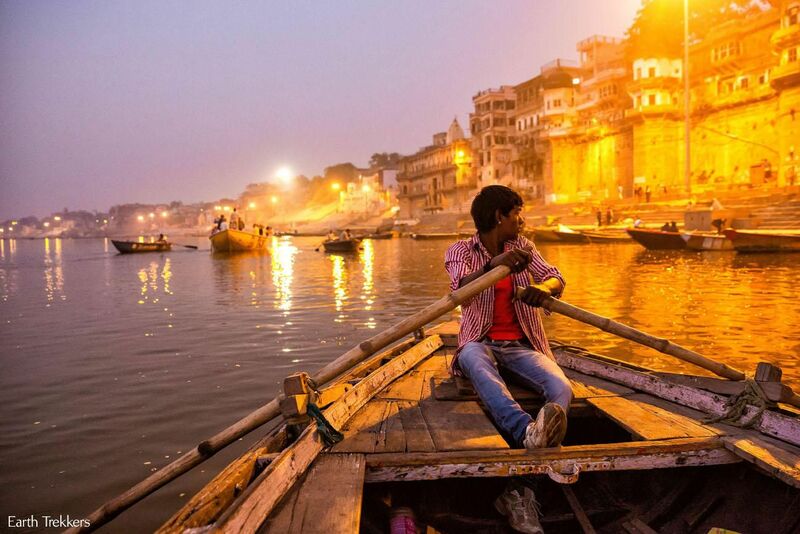 Sunrise on the Ganges River in Varanasi, India. 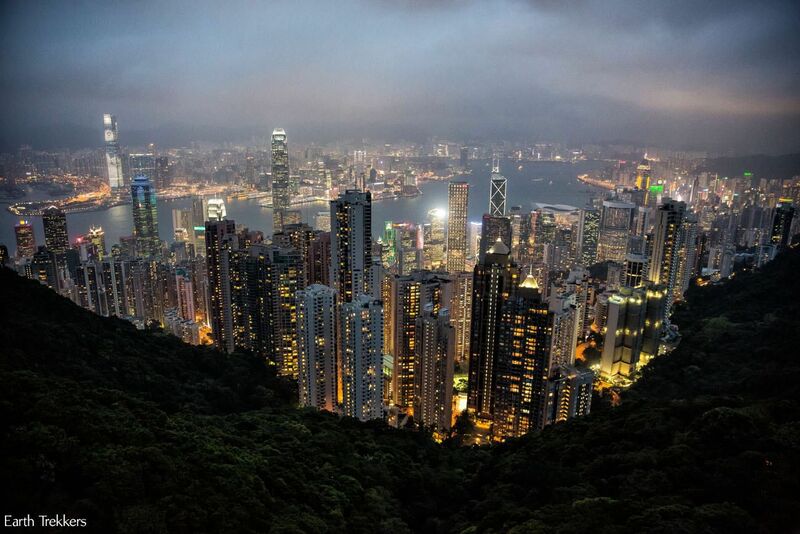 Watching the sunset from Victoria Peak in Hong Kong. 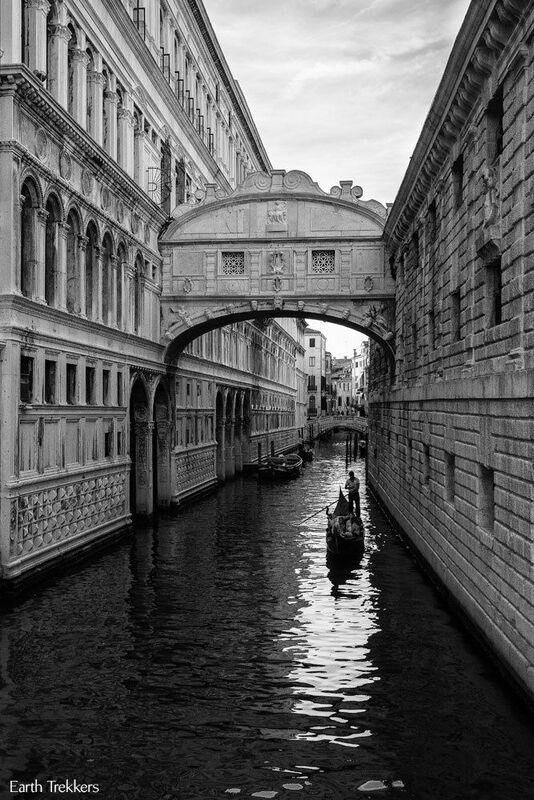 The Bridge of Sighs in Venice, Italy. 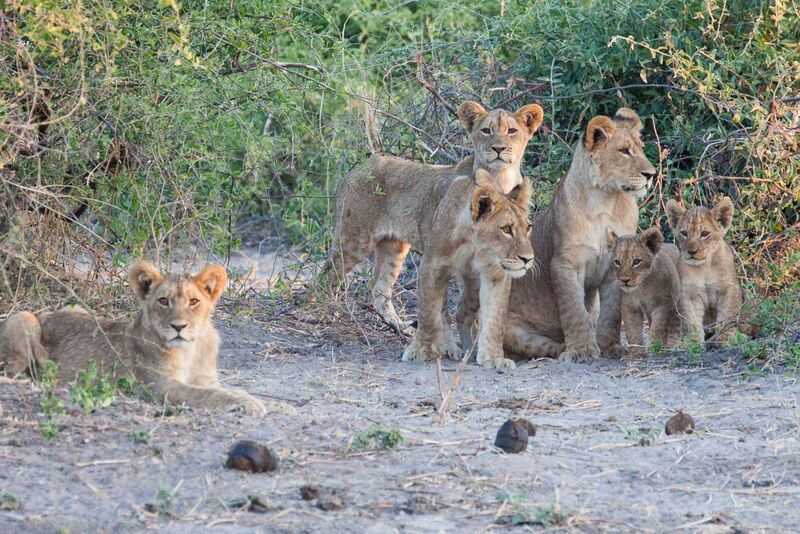 Here are the lions, watching from the other side of our safari jeep. My favorite view in Sydney, Australia. Watching the sunset from Luna Park. 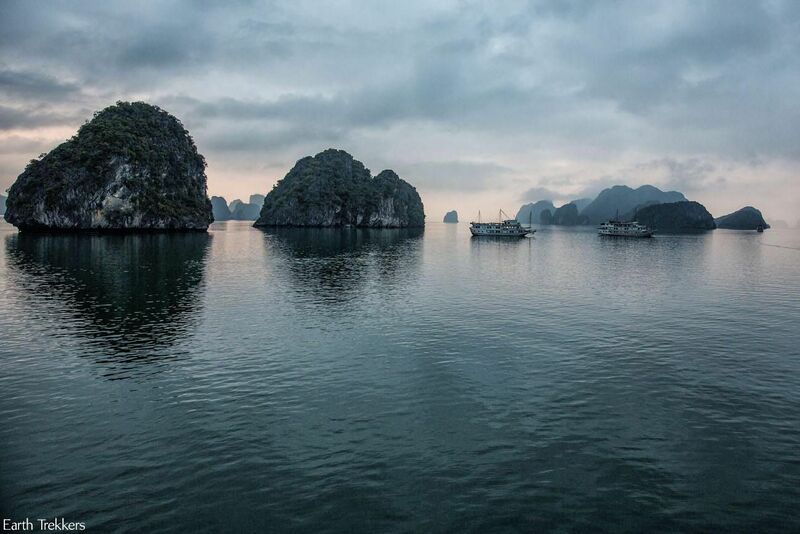 A three day cruise on Ha Long Bay in Vietnam. 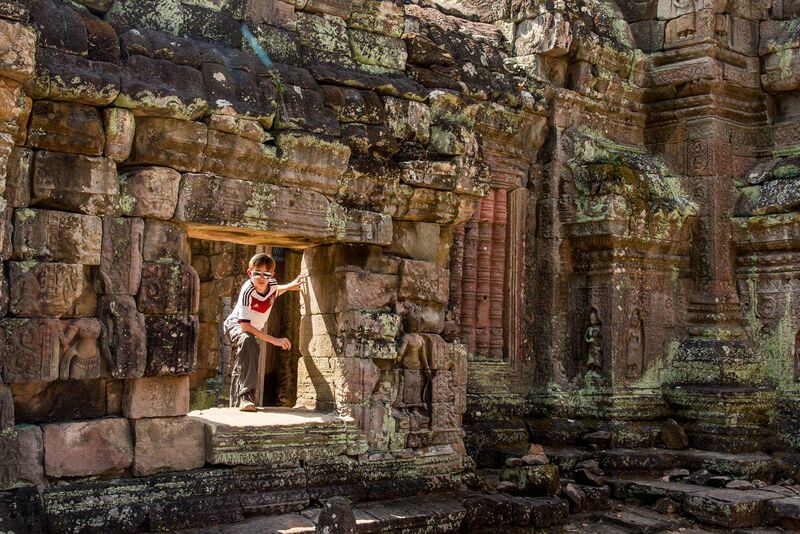 Exploring the temples of Siem Reap, Cambodia. If only Indiana Jones looked this cool. 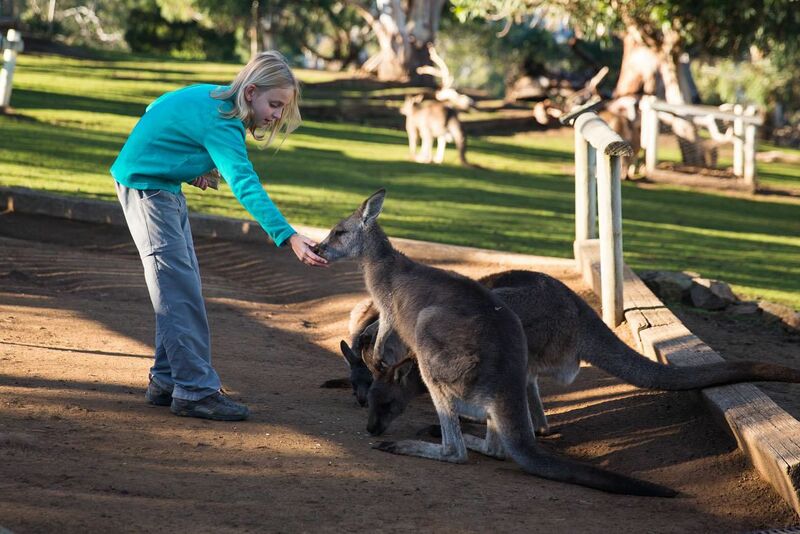 Almost as fun as feeding those elephants in South Africa, feeding kangaroos in Tasmania was fun for the whole family. 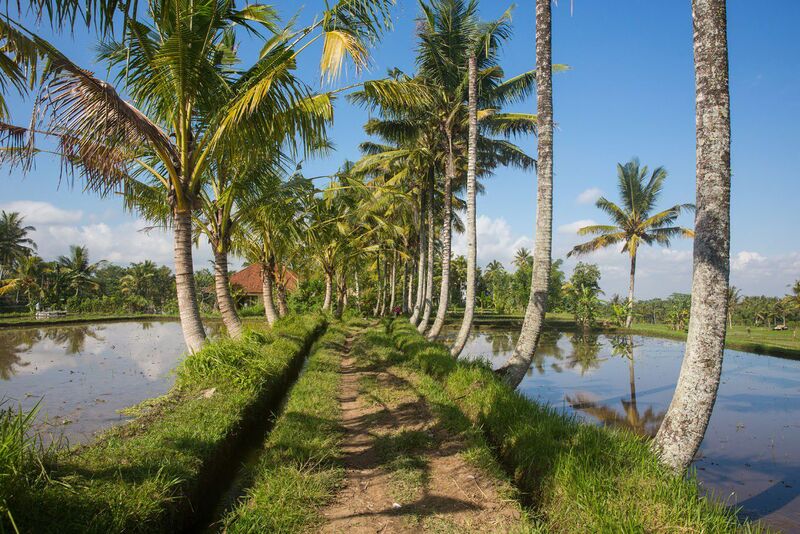 Walking through the rice fields, one of our favorite activities in Bali. 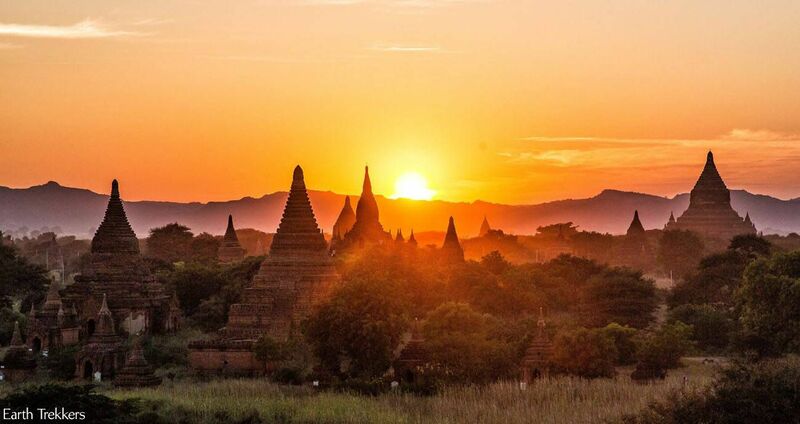 Bagan, Myanmar, one of the best sunset spots in the world. 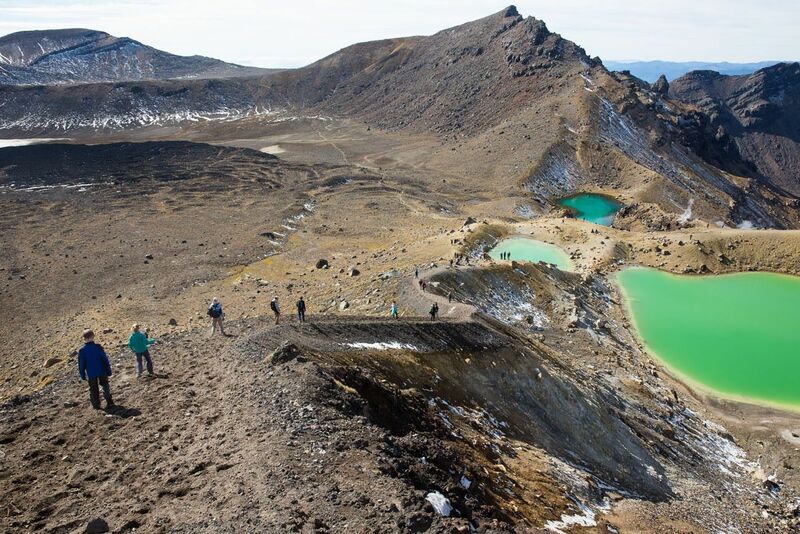 In our opinion, the Tongariro Alpine Crossing is New Zealand’s best single day hike. I love capturing our kids capturing the sights on their iPods. 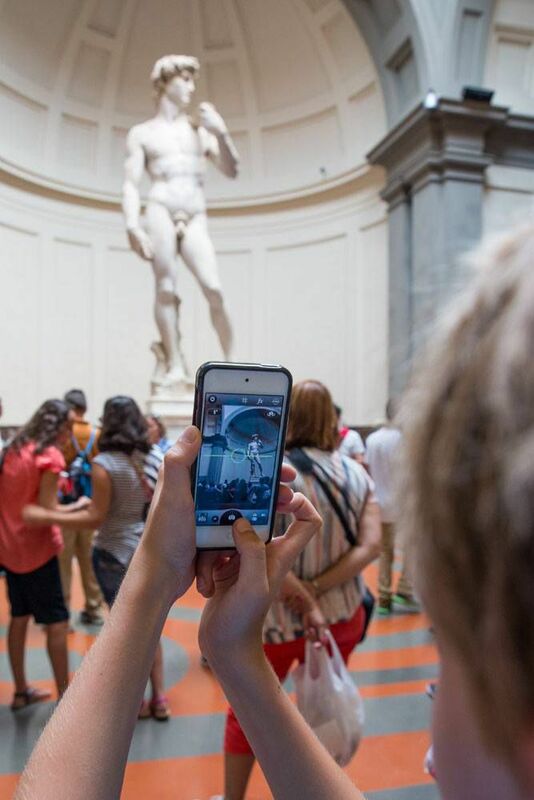 Here we are viewing Michelangelo’s David at the Accademia Gallery in Florence, Italy. On the way to Everest Base Camp in Nepal. 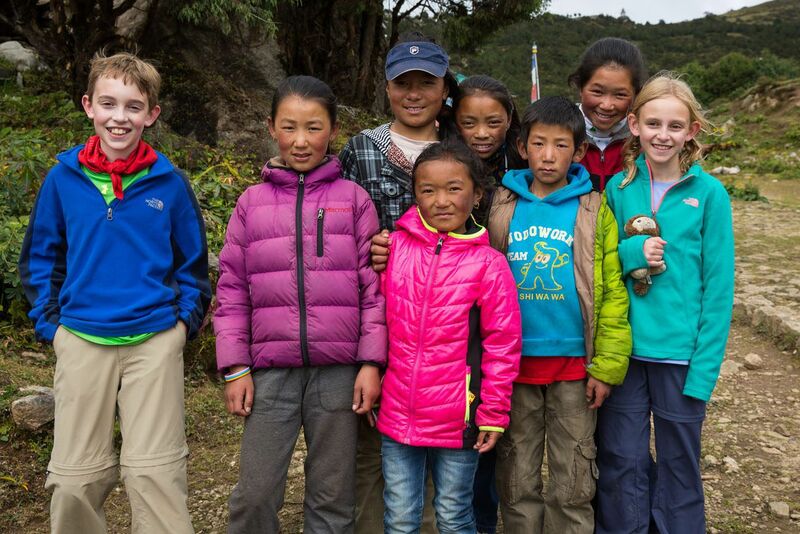 We love meeting the children along the way. 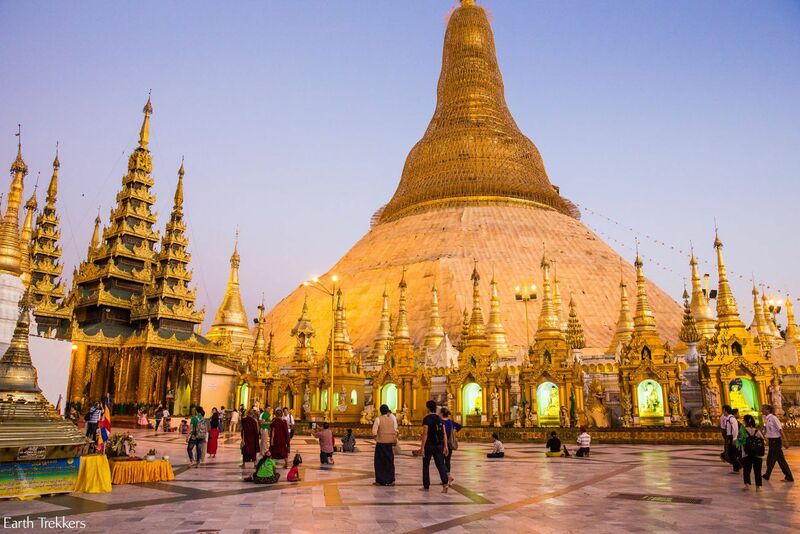 Another view of the Shwedagon Pagoda in Yangon, Myanmar. This was our first shiny, golden pagoda and it made quite an impression on us. 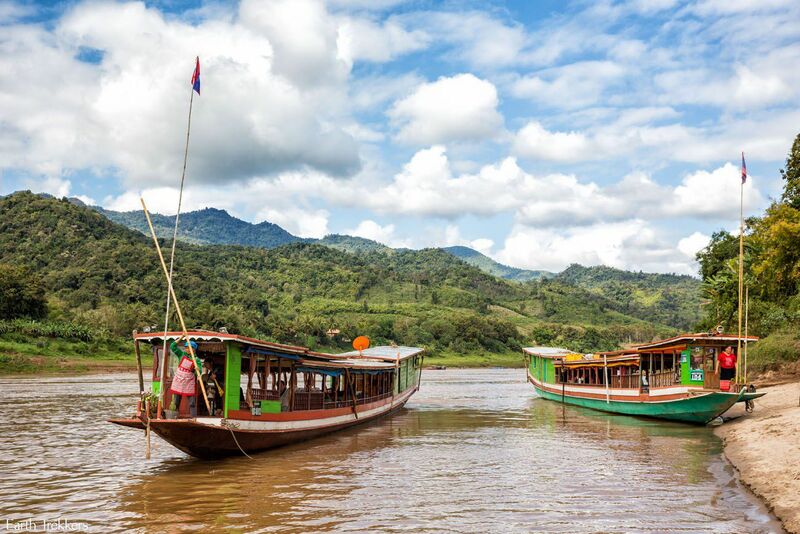 The two day cruise down the Mekong River from Thailand to Luang Prabang, Laos was unexpectedly awesome. We only spent one week in Laos but we should have stayed longer. Heading back from Everest Base Camp. The scenery is always changing and always magnificent. 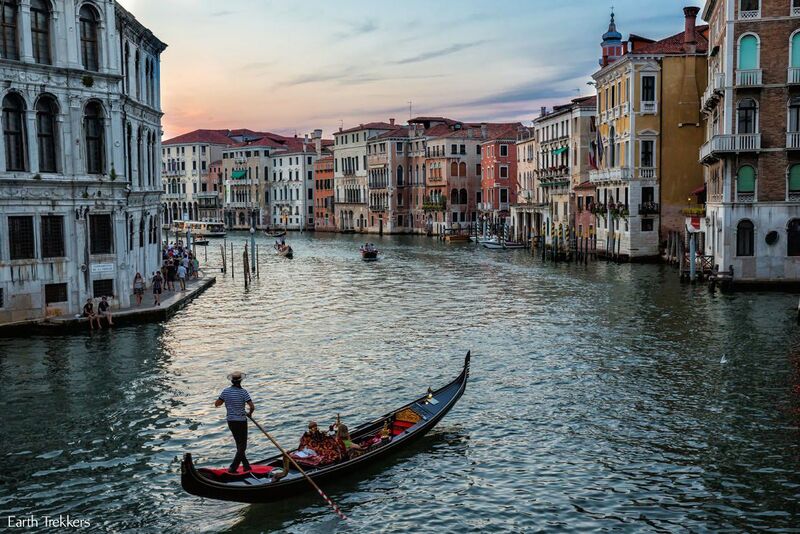 Watching the sun going down over Venice, a view that we would never get tired of. 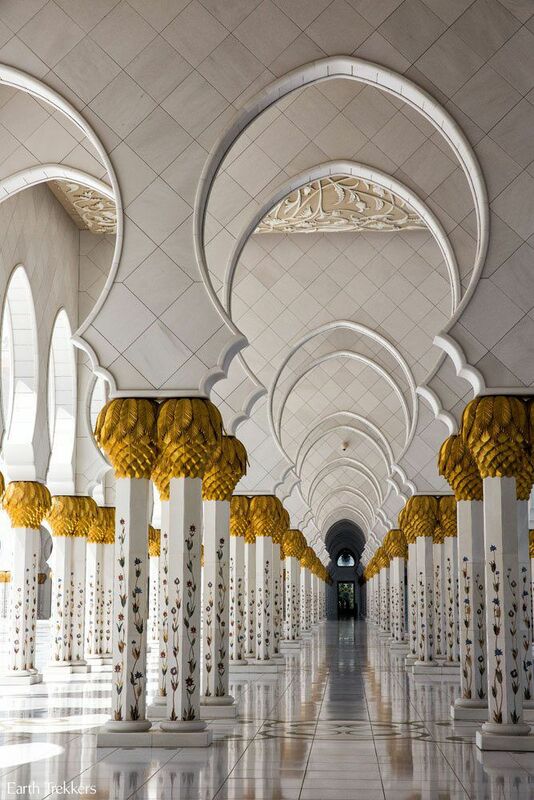 Like the Shwedagon Pagoda, the Grand Mosque in Abu Dhabi made quite an impression on us. There are five more amazing photos of this building sitting in my hard drive that could be included in this post. 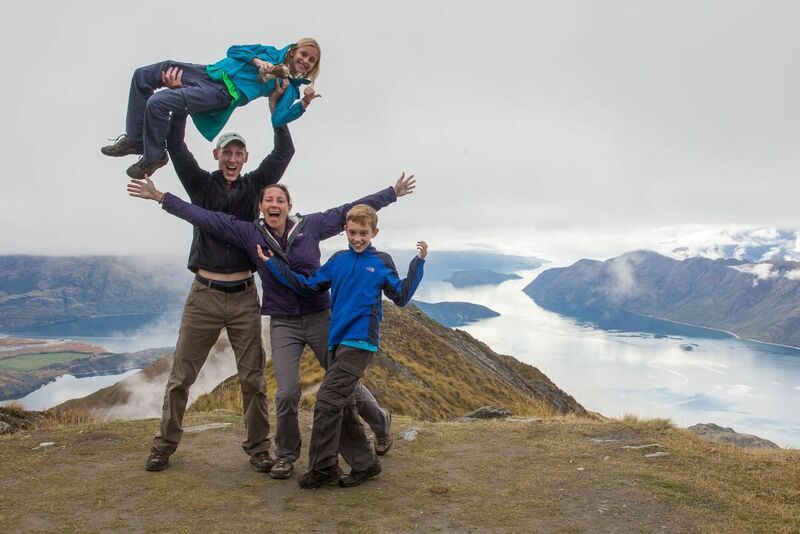 And, so here it ends with a final family photo from one of our favorite spots in the world, New Zealand. It has been a spectacular year with just a little more time to go. Here’s to making the most of it! WOW! Love your blog! Am traveling to Mendoza and reading all about wine tasting! I hope to taste all wine possible! I was recently in Bagan, Myanmar lovely place. Researching Ireland itineraries for a celebratory trip for our triplets’ graduation from high school and found your blog. Wonderful stuff! Wonderful life you are living! Thank you for sharing! You’re welcome, Jill! Thanks for writing to us! 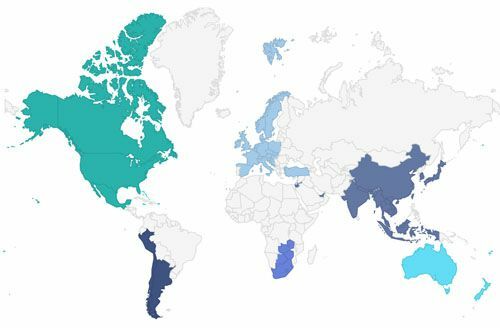 Thanks take me to everywhere in the world. It looks like travel with you when surfing your blog. I’ll go with you wherever you go! 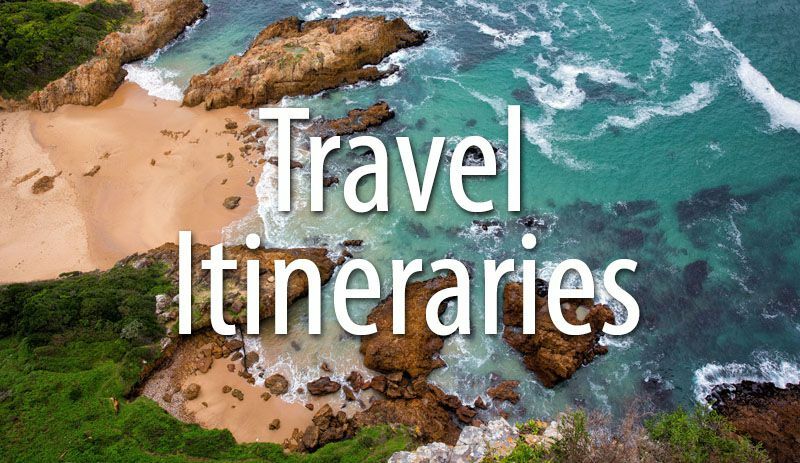 I came across your blog whilst looking for travel magnets organizers on pinterest! ? 4 hours later, I am in such awe and deeply moved by all your travel photos. I am from the Philippines and now live in beautiful Ireland and have travelled a good bit around the globe and everyday I long for more adventure. Your blog has inspired me more and I am now in the middle of looking for a few weeks holiday in Asia. Thank you so much Julie, and to your family for being an inspiration. Today I stumbled onto your blog while researching a hike in Norway and 4 hours later I’m still reading about your amazing adventure. I wanted to say thank you for documenting your adventure. Your posts, insightful comments, details on the day-to-day, the good and the bad, and the amazing photos….have been inspiring to read/see. 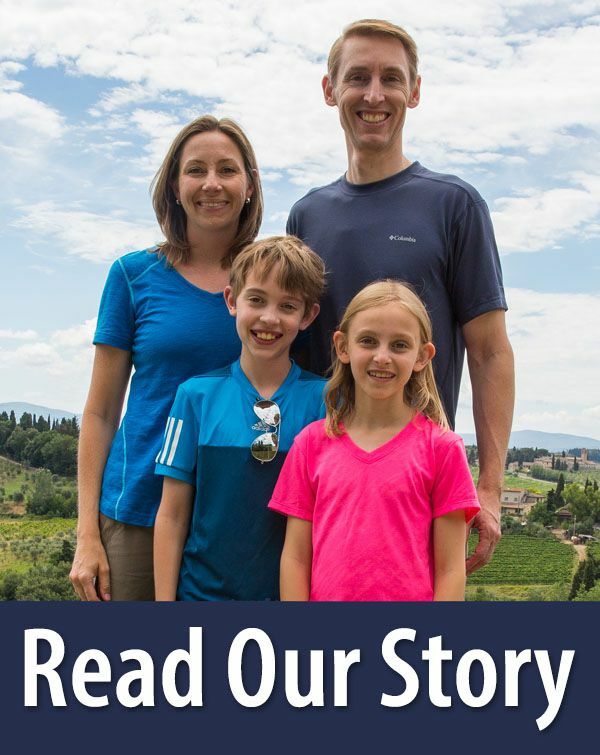 My family and I also love to travel, and while my two children are a little bit younger than yours – I’m excited to see what could be possible in just a few years from now. I can’t wait to read more about your adventures! Thank you for the wonderful comment. I am glad that we can be an inspiration for you and your family. 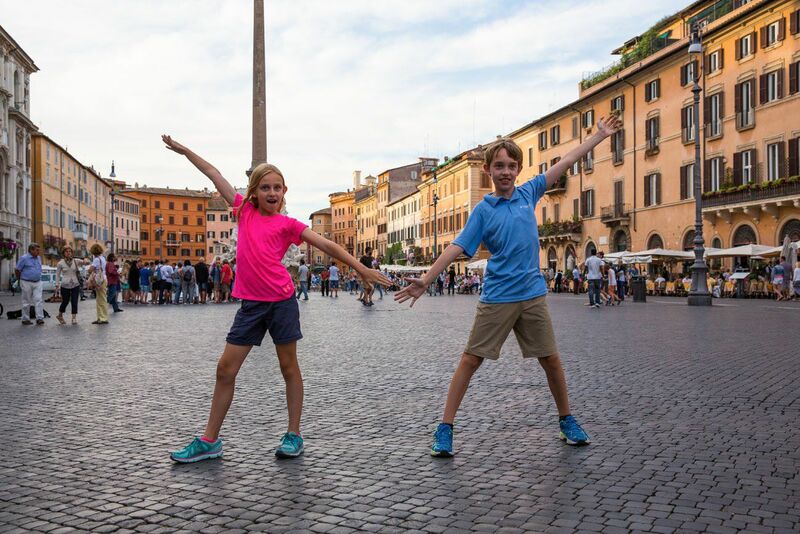 I have been surprised at how well our kids travel and what they have been able to do…start them early with traveling, it makes things so much easier later! Julie, I was a patient of yours with Dr. Matz. I have thoroughly enjoyed following your family’s adventures this past year. I hope that when you travel in the future you will still post to this site so I can see more of the world. Thank you very much!!! Hello, Terry. Of course I remember you! We most definitely will continue traveling in the future, just maybe not as long term as what we have just done. 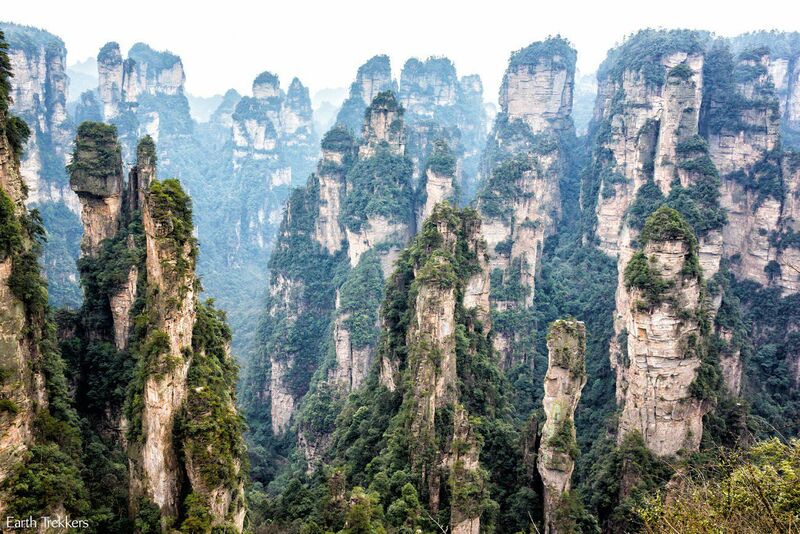 The world is full of so many amazing places to visit and I really just feel like we scratched the surface. I still have plenty to write about once we get home. Thanks for following! Hey Jul. Am I reading this correctly? The number of LIKES is 2.1k. Wow. I’ve so enjoyed reading the comments, really fan mail, on your blog. They are a testament to your and Tim’s hard work in making the trip happen and in keeping the quality of the experience you’ve given us so consistently great throughout the long year. 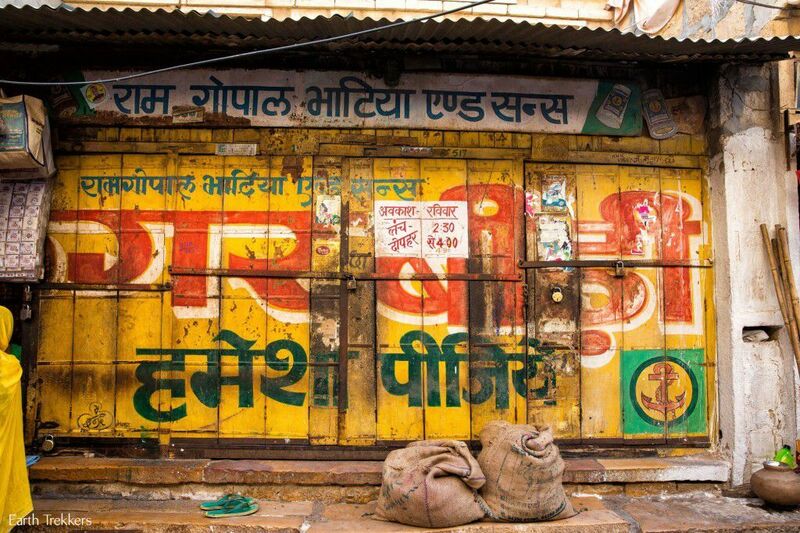 And this particular blog shows that you always strive to get the best shot. 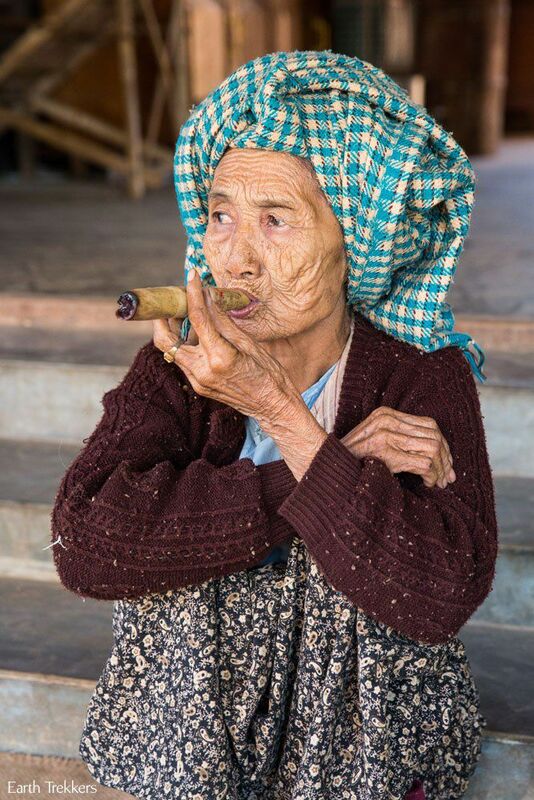 I was there with you when you snapped the one of the Myanmar grandmother smoking the cigar! It was on a break from cycling on the dirt roads of Bagan to see the temples. We were welcomed onto a family’s back porch by the woman of the house while Tim was getting help in fixing a bicycle tire. I was stunned when the grandmother came out and squatted down on her haunches like it was nothing and started smoking her afternoon cigar. Now that was lucky! Hi Mom! 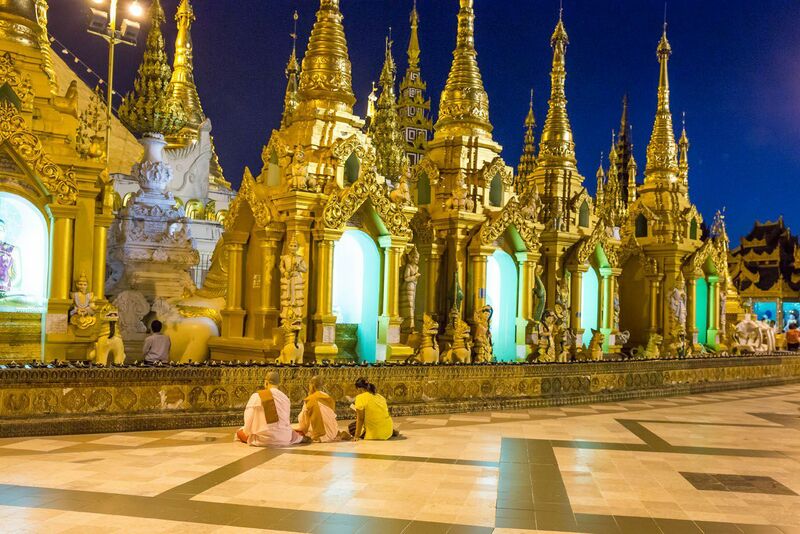 You picked a good place when you chose to join us in Myanmar. Cycling Bagan was so much fun, the balloon ride was amazing, and you were even there when poor Tyler got so sick. One more month to go and then you have us back! Congrats you guys! That 365 mark is definitely a rewarding one. Loved your photo walk down memory lane. 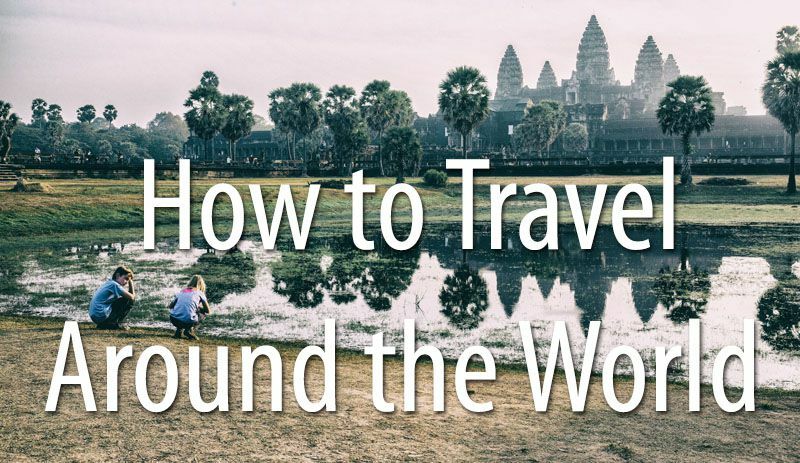 We have some of the same pics and your photos inspire us to visit to Myanmar, Nepal and some of the other spots our family hasn’t made it to yet. Keep it up! Thank you, Tracey. We have been watching your travels through South America with fascination. 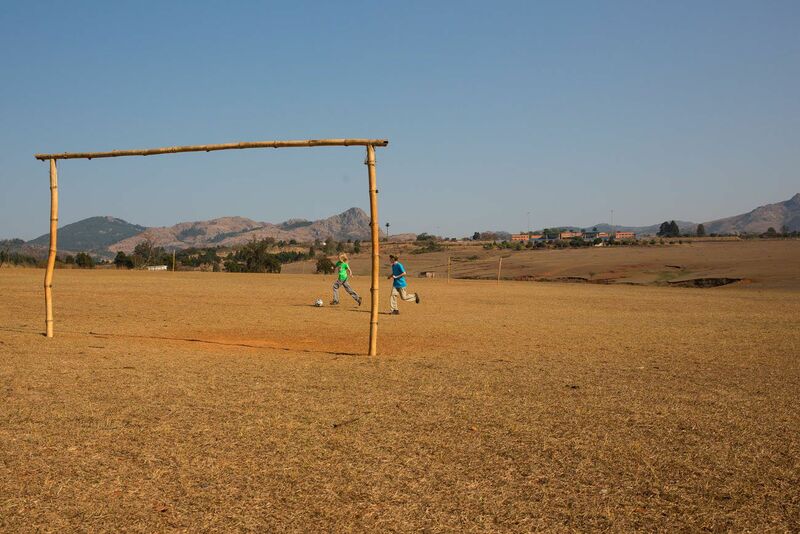 We are not making it to that continent on this trip but are hoping to have a Part 2 RTW tour sometime in the future. Happy travels! I just randomly came across your blog tonight while researching the Trolltunga hike (going next month!) And I’ve been reading it obsessively for the entire 2 hours I’ve known it existed. 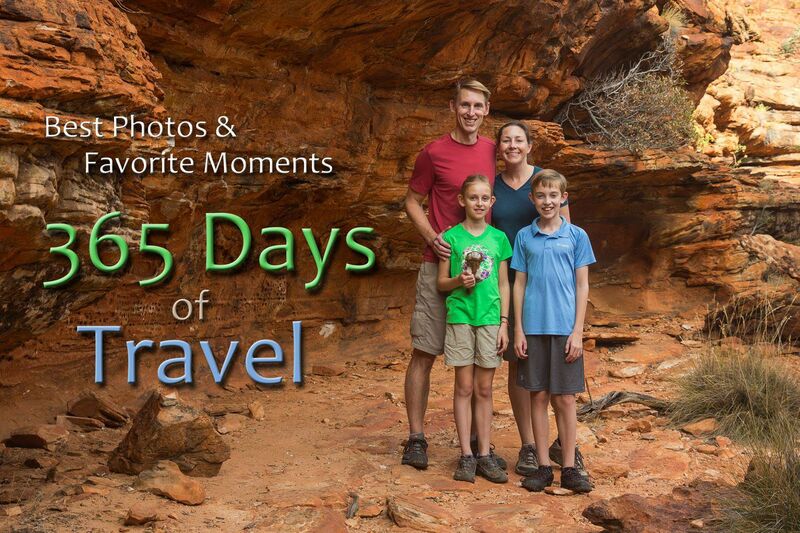 Your family inspires me and I hope I am able to travel like you throughout my life. I’m an American living in France and my boyfriend and I both have caught the travel bug big time. 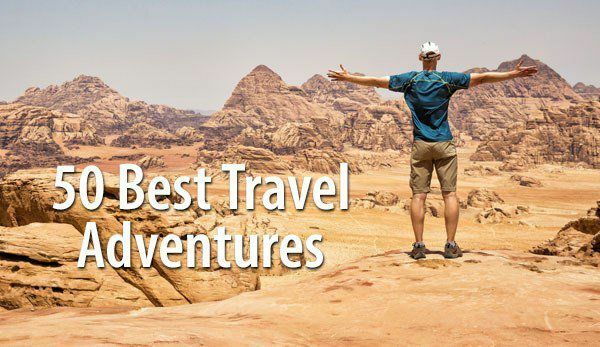 We have many travel dreams and aspirations and I will definitely be using this blog as a guidebook for future trips. 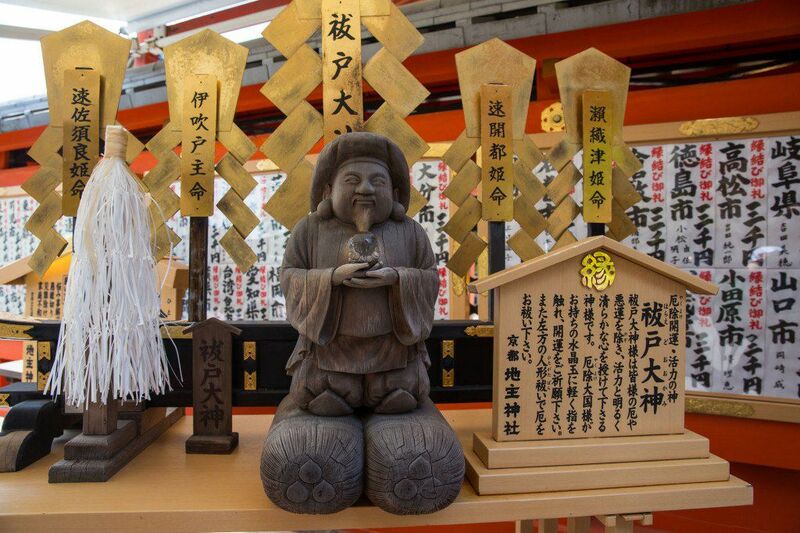 The cultural observations and travel information you provide are very useful and very fun and interesting to read. 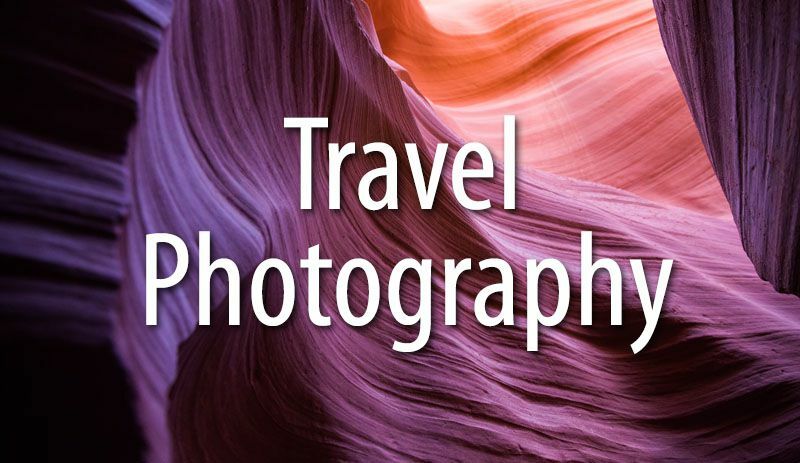 Plus, your photography is absolutely beautiful! You have some really breathtaking photos. Your children are going to grow up to be very mature, cultured, and well rounded people. It’s a wonderful gift you are giving them. 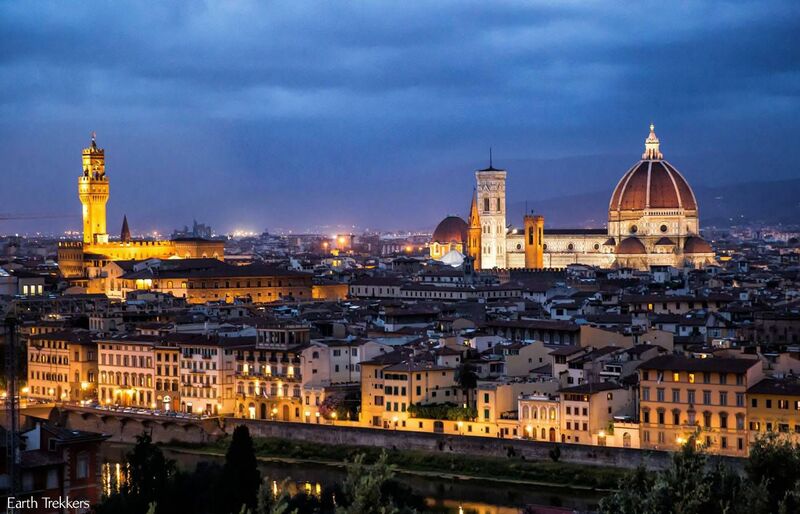 There is nothing more valuable in life than the experiences you get with travel and exposure to different cultures. Thank you for sharing your experiences, I’m so glad Google let me stumble across this blog tonight! You have just given us the best compliment we could get. 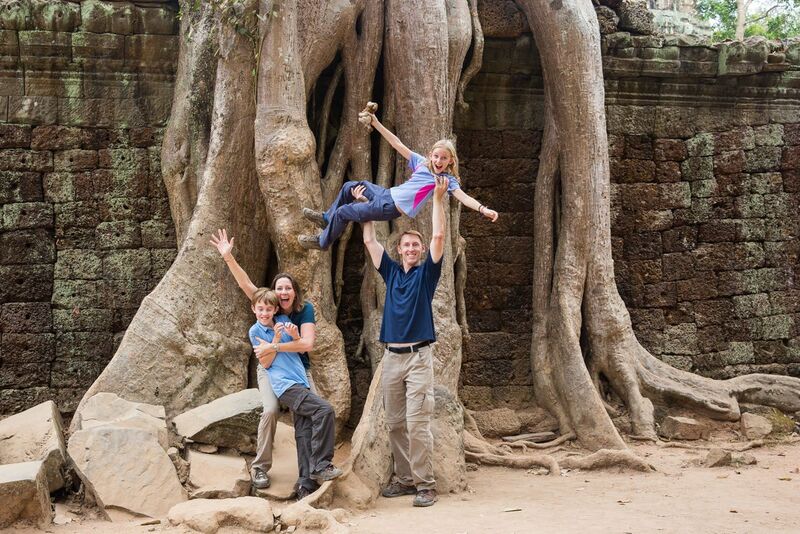 Our goal is to inspire other travelers and families to go outside of their comfort zones and see the world. 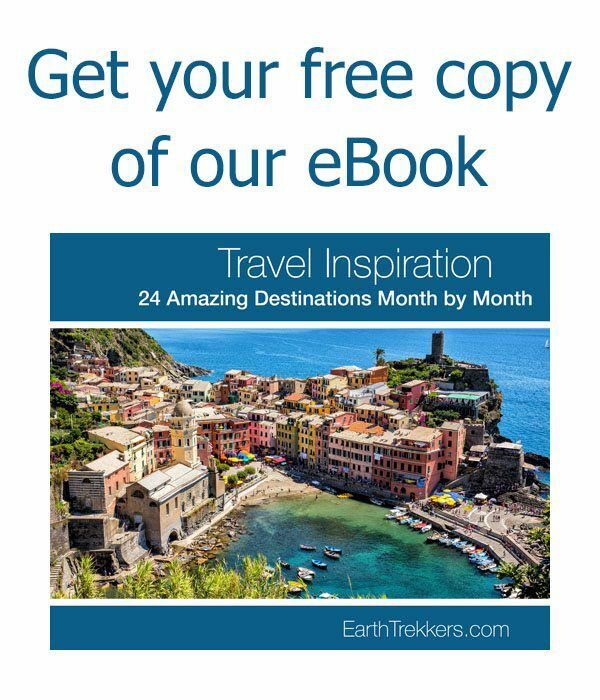 I remember sitting in front of my computer screen, reading travel blogs for inspiration. Sometimes it is still hard to believe that we are now on this side of things. I am so glad that Google let you stumble across our blog, also. Please let us know if you have any questions or travel advice, we would love to help. Have a great time in Norway and in France! Merci!